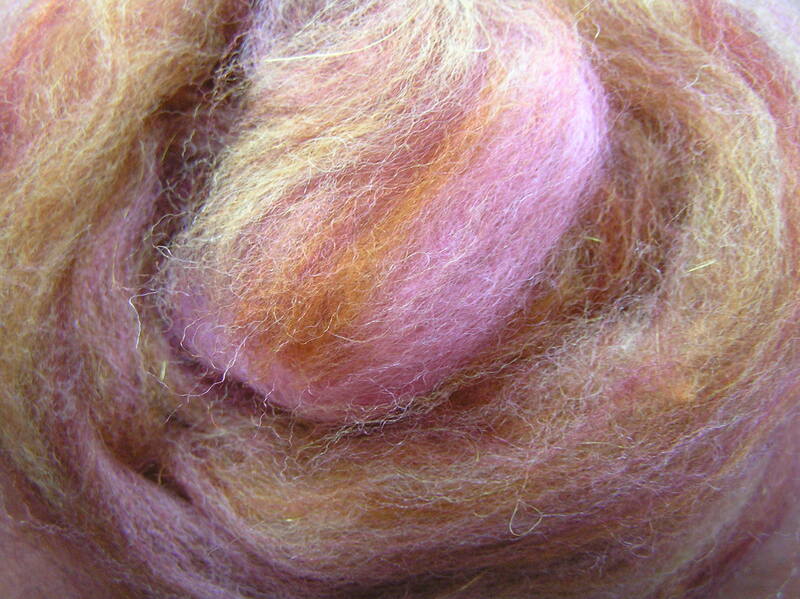 Having seen some beautiful yarns, such as this Glowing Ginger by Bowerbird Knits, I decided to try fractal spinning for myself. 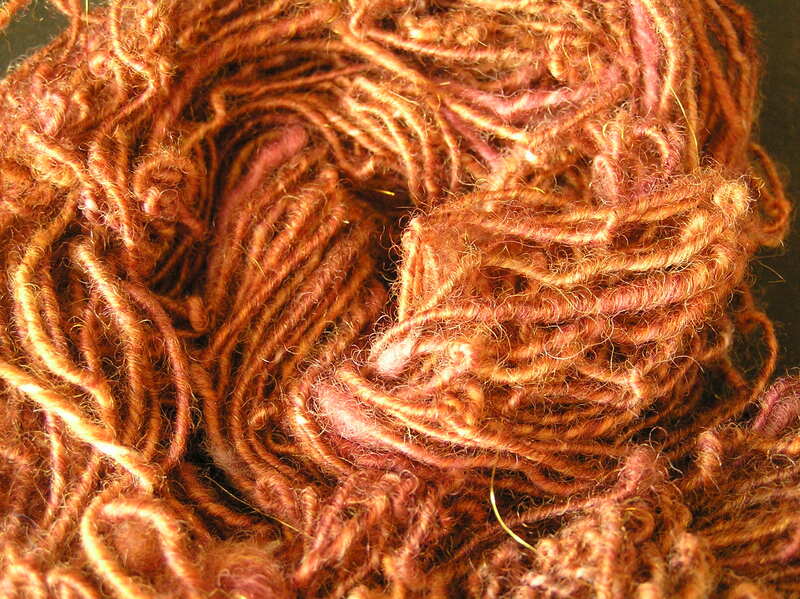 I used Corriedale fibre from My Heart Exposed in a colourway named Clarese, a beautiful mix of greens, rust browns and peach tones. 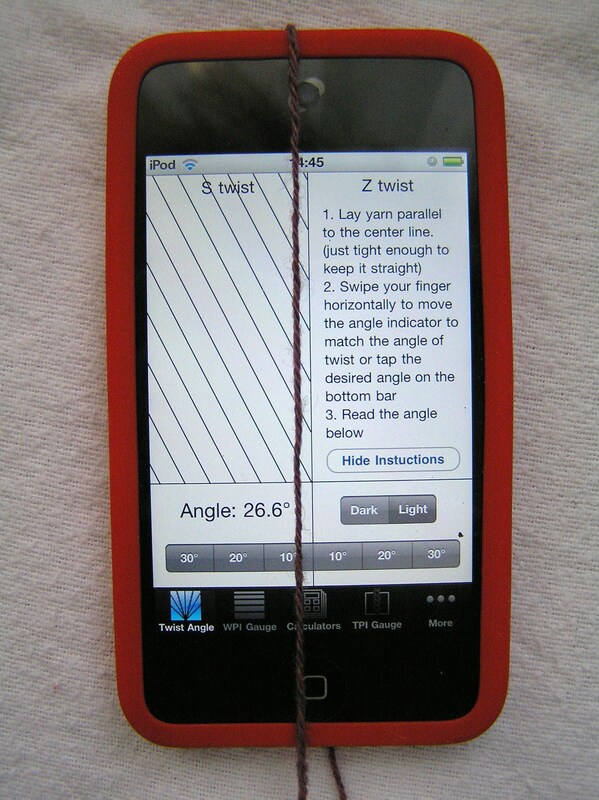 I split the fibre into two strips, lengthwise. 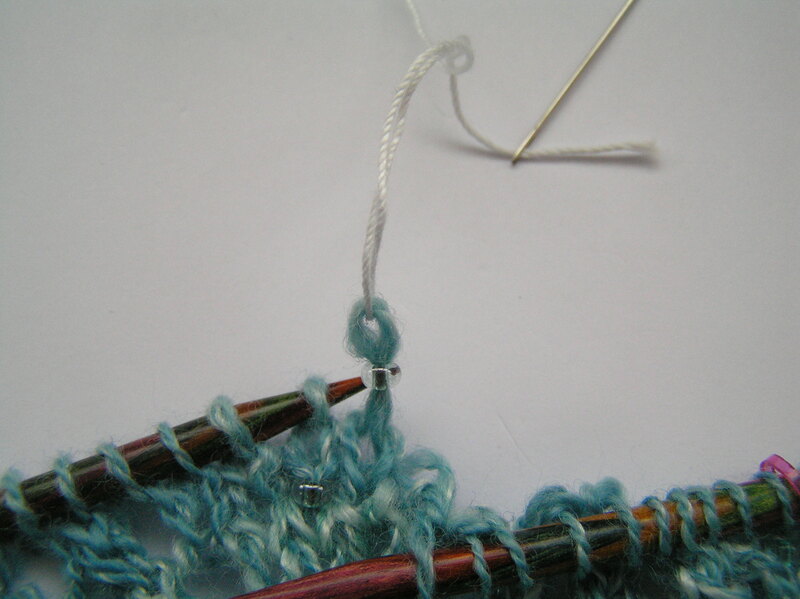 One length was left as it was, the other split lengthwise into two again, giving a shorter fatter piece of fibre and two thinner strips. 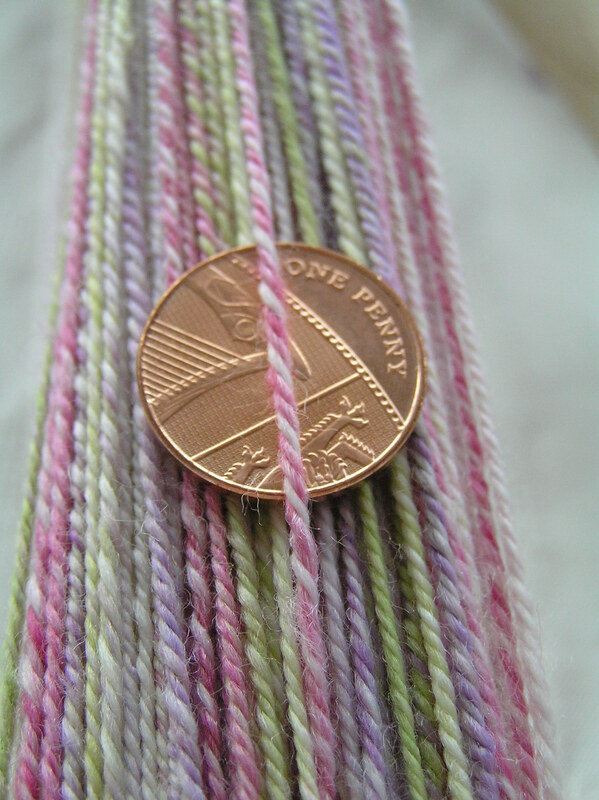 The idea behind fractal spinning is that the singles will have colour repeats at different rates which will give an interesting effect when plied. I am pleased with the end result, but possibly the colours (lovely as they are) were a little too similar in tone for the fractal patterning to show as distinctly as it could have done. 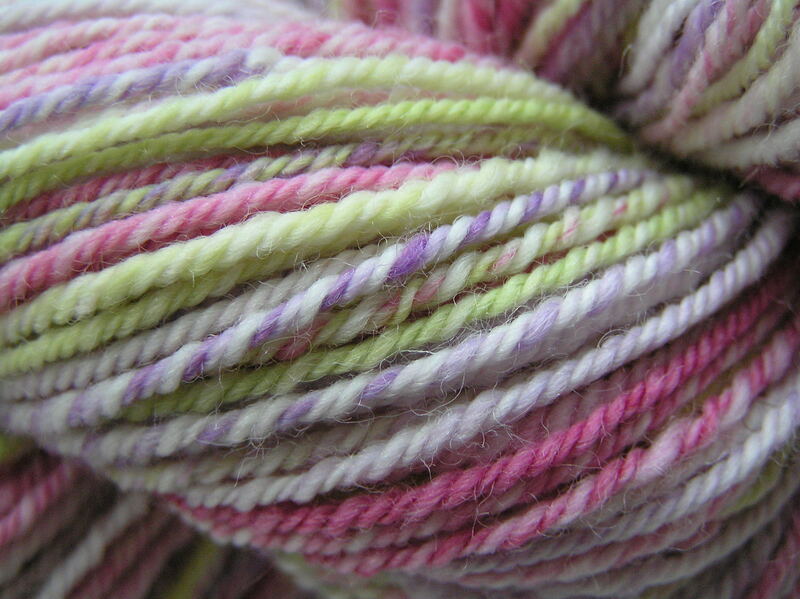 I’m looking forward to making something from this to see how the colours appear when knitted – I’m imagining that it should have lots of subtle changes. 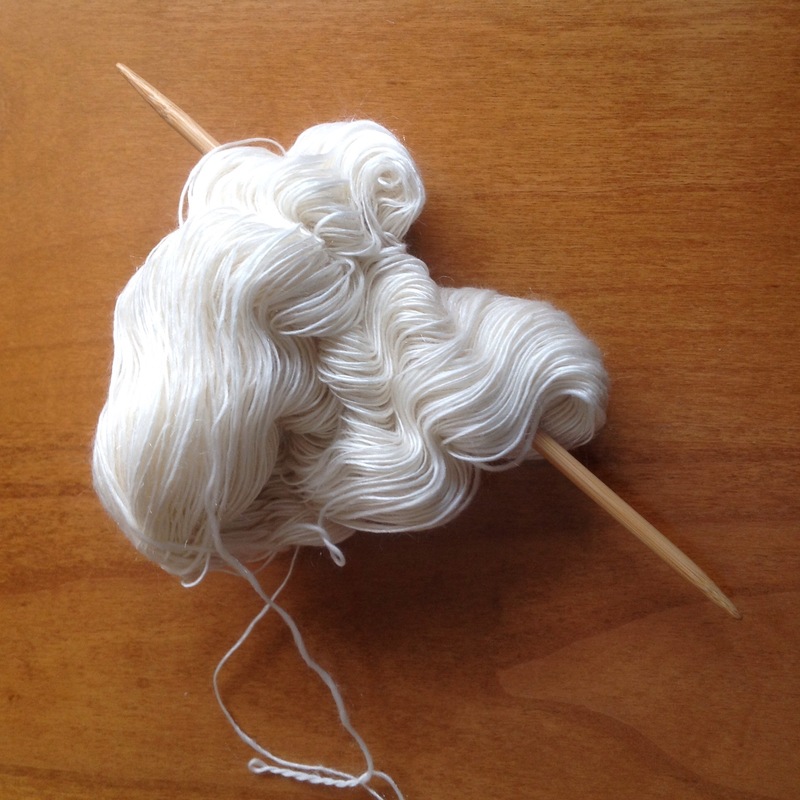 From Fibre to FO (a rare event)! A couple of months ago I purchased some ‘hotchpotch’ packs of fibre from Helen at My Heart Exposed Yarns (www.folksy.com/shops/myheartexposed). 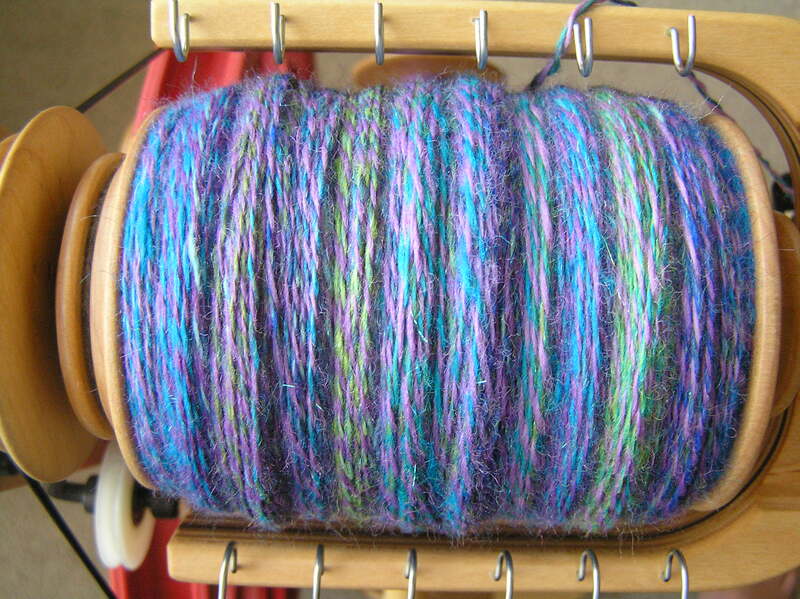 I used one pack to experiment with corespinning and over Christmas I put the other pack of blue shades to good use. 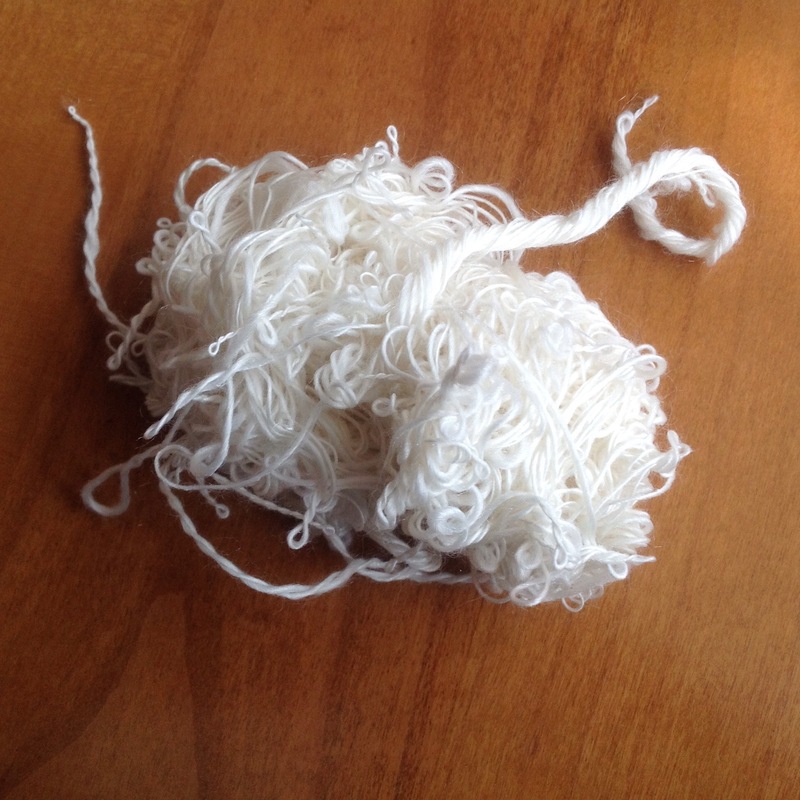 I used the paper as inspiration for creating the yarn. 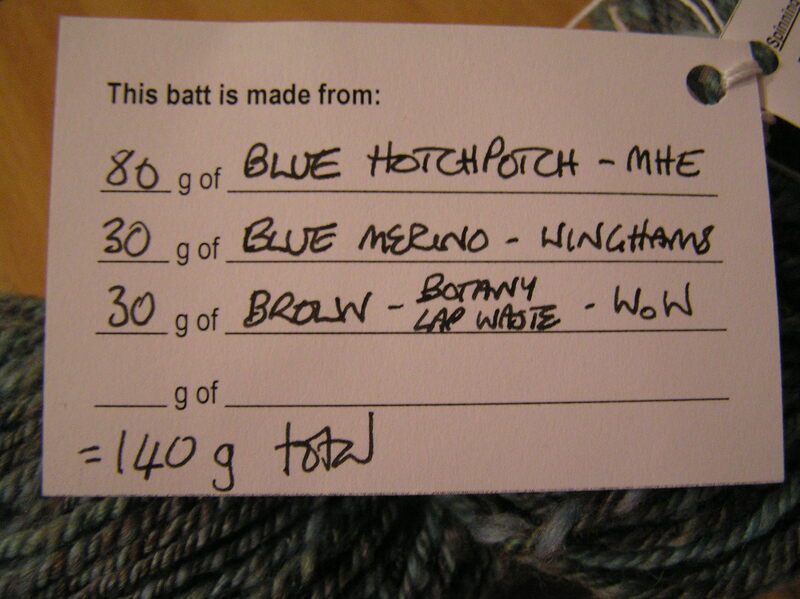 The ‘hotchpotch’ was mainly shades of blue with a bit of plum thrown in – I added some blue merino and some brown mystery fibre that I received in a waste selection from www.worldofwool.co.uk. I’m still not 100% sure about the way this turned out, but hey, I actually finished something! Then it came off – wheeee! It came out a bit thinner than I had aimed for, so another skein that goes in the big ‘I’m not quite sure what I’m going to do with this’ pile. 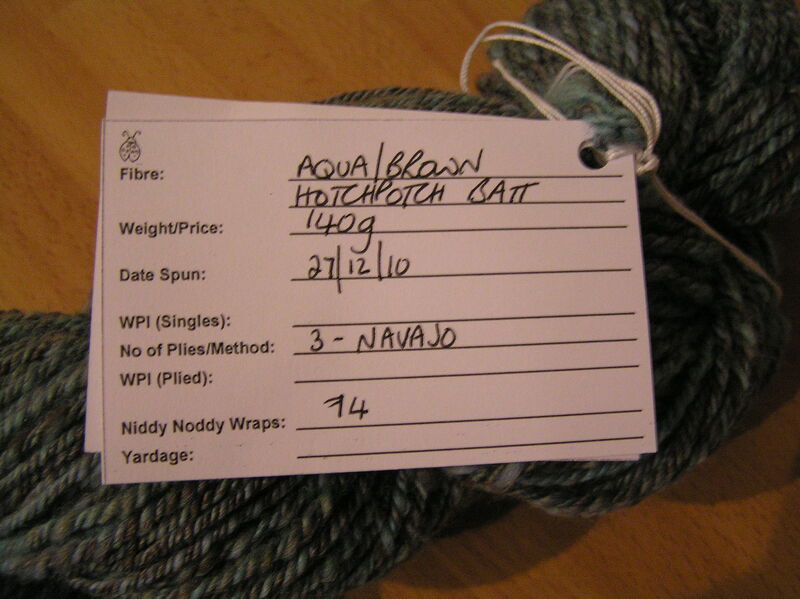 The skinniness of this yarn is averaged out by the 200g of Light Grey Suffolk that I spun aiming for an aran-ish weight to make some nice thick boot socks with – it started well, but I got distracted and spun a couple of bobbins of really fine singles before going back to it. 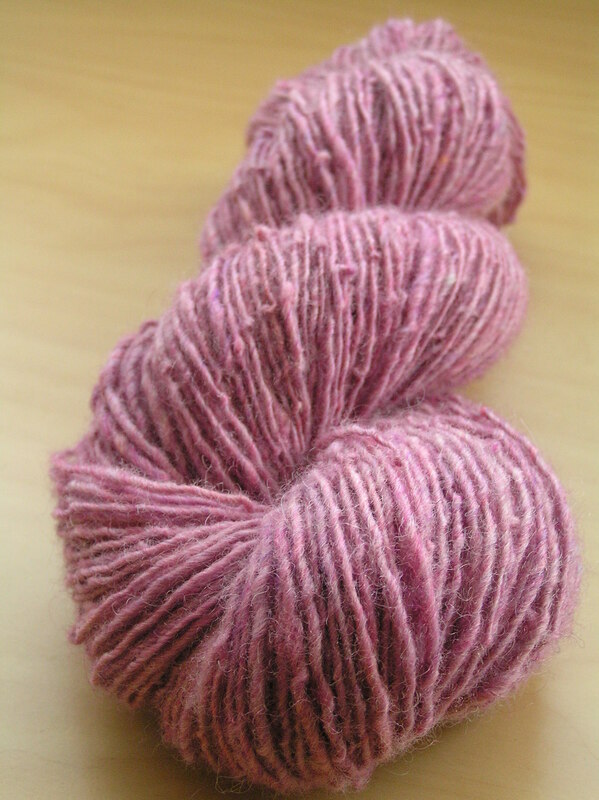 The second and third bobbin ended up on the thicker side so I have some 3 ply bulky-ish yarn instead. I have been working on a record keeping system, I just need to remember to fill it in at the vital points so I can remember how I got the yarn the first time! I have somehow managed to lose this. (I never lose anything. Ever…) If you have any idea which safe place I’ve put it in, do let me know. They say ‘there’s an app for that’ – oh yes, there certainly is! 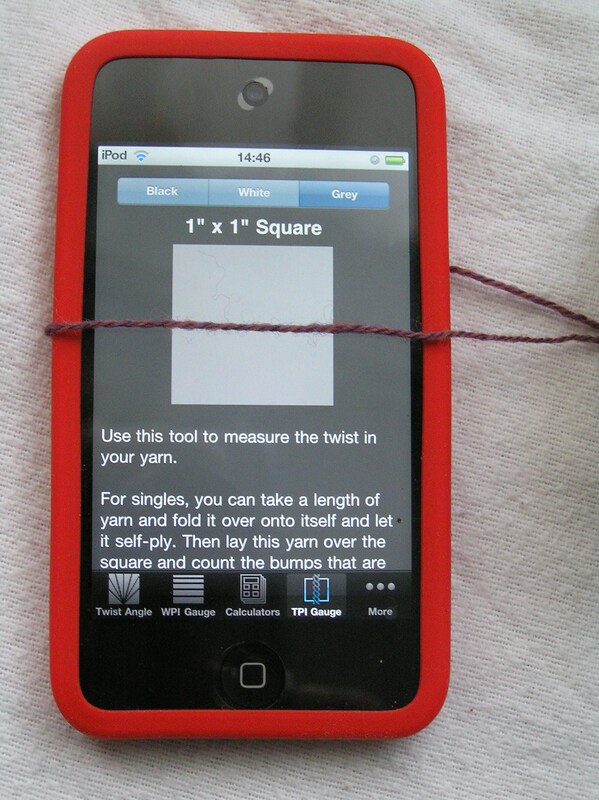 There are quite a few for knitters – I’m working my way through some of the free stitch counter apps and working out what I like and don’t. 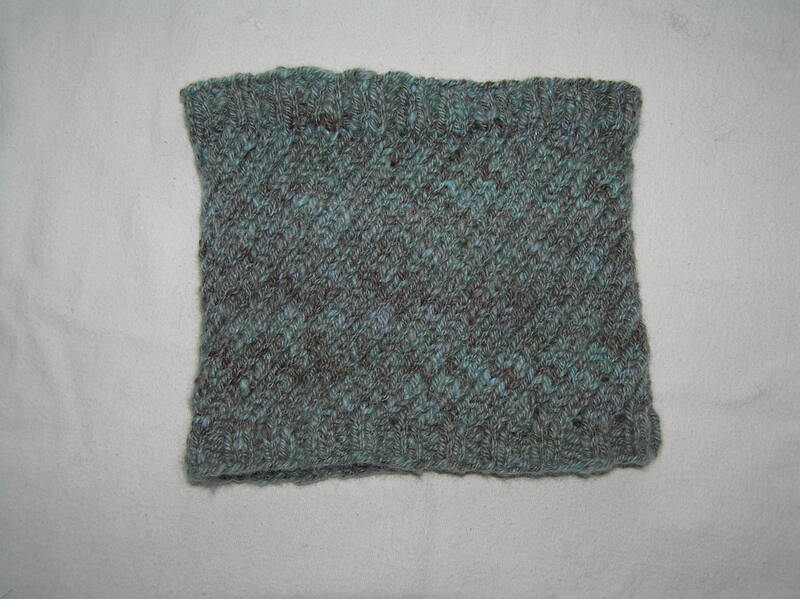 So far, Knit Counter Lite is working out well for me. 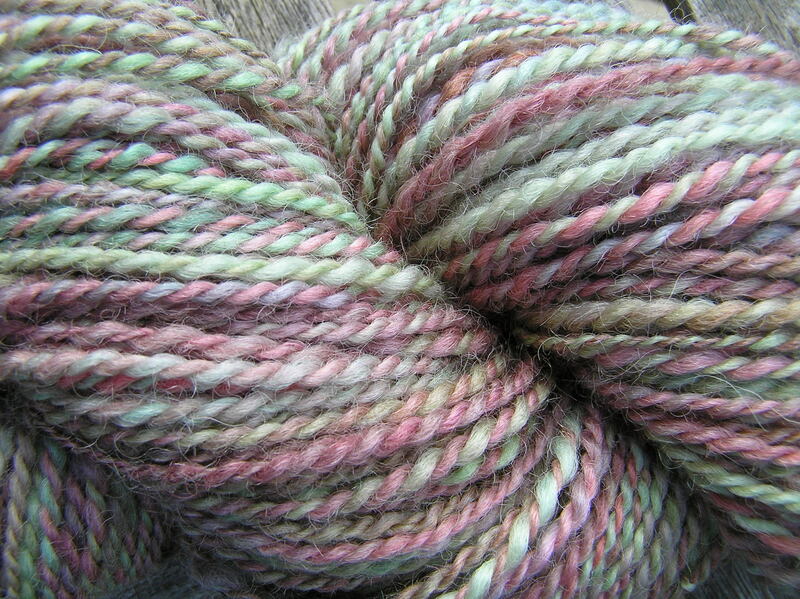 I’ve been spinning for just over a year, so maybe I’m ready to move on from the ‘look I made yarn’ stage to learning more about this technical looking stuff? 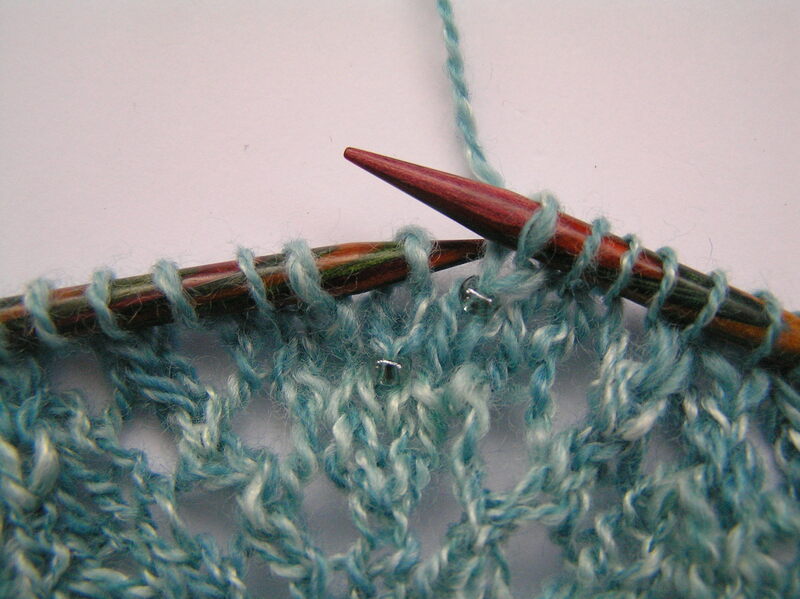 Knitting gifts for Christmas always seems such a good idea – but why does it always end up taking more time than you have? 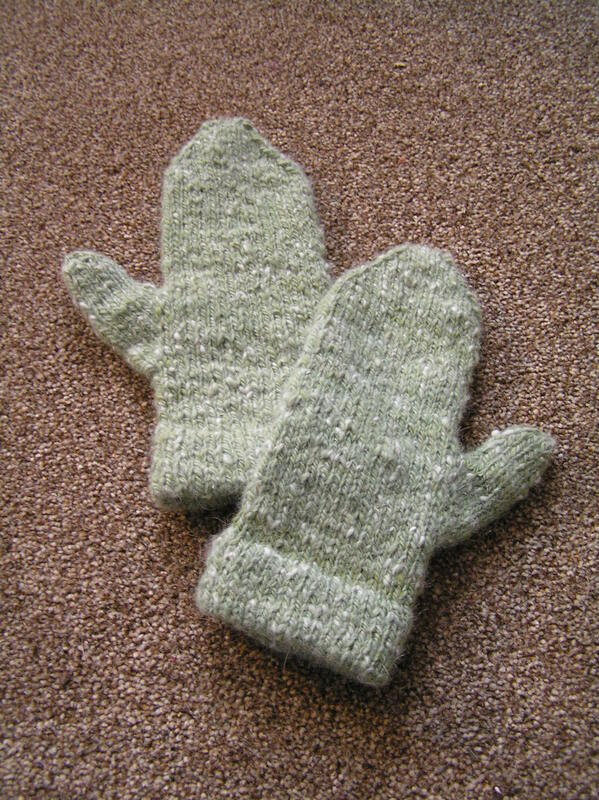 The snow and ice has returned and it meant a day of going nowhere and an excuse to do nothing but knit. 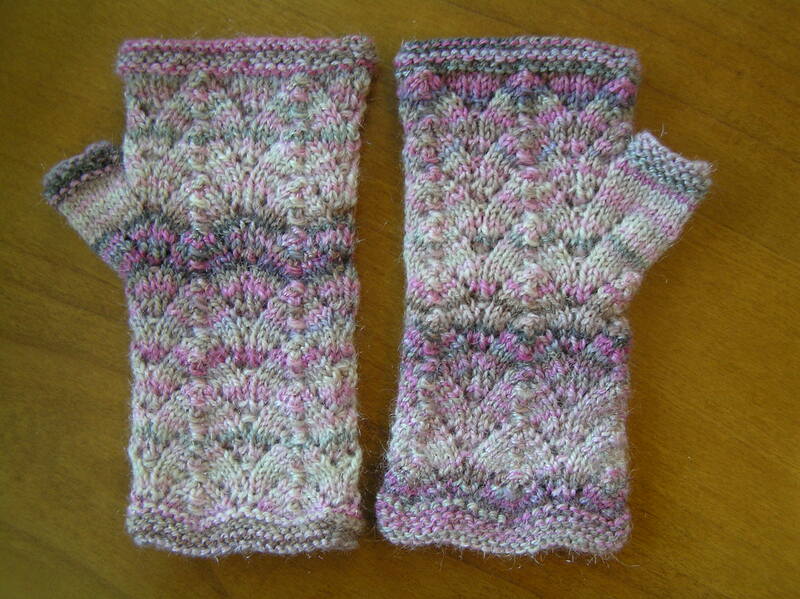 I’m doing three pairs of mittens and have finally finished one pair, the other needs another three rows per hand and I have finished one of the other pair (which was the pair I started first…). 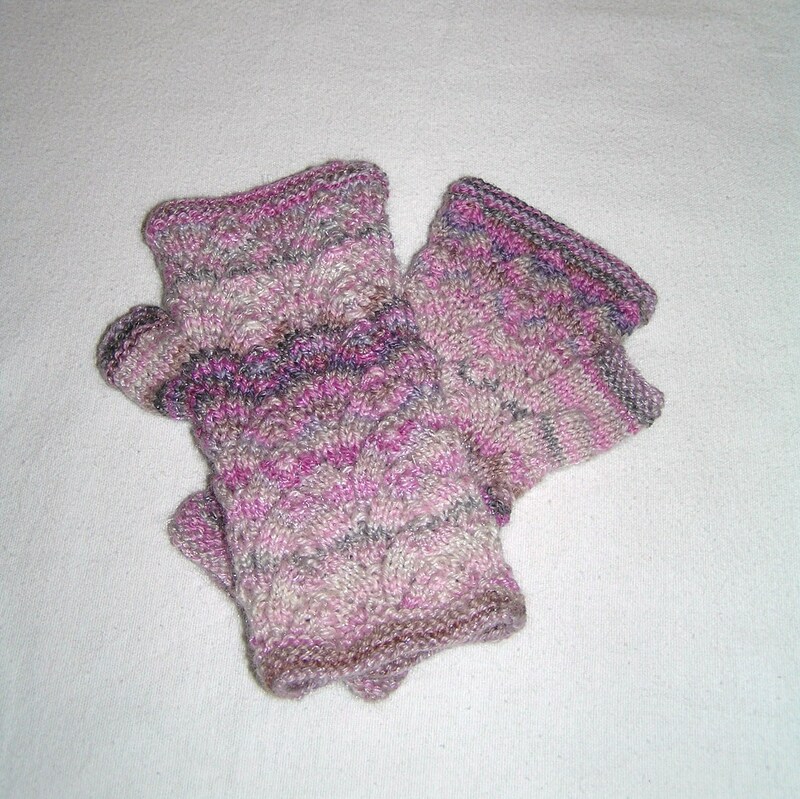 This pair are for my mother-in-law, a lover of animals. 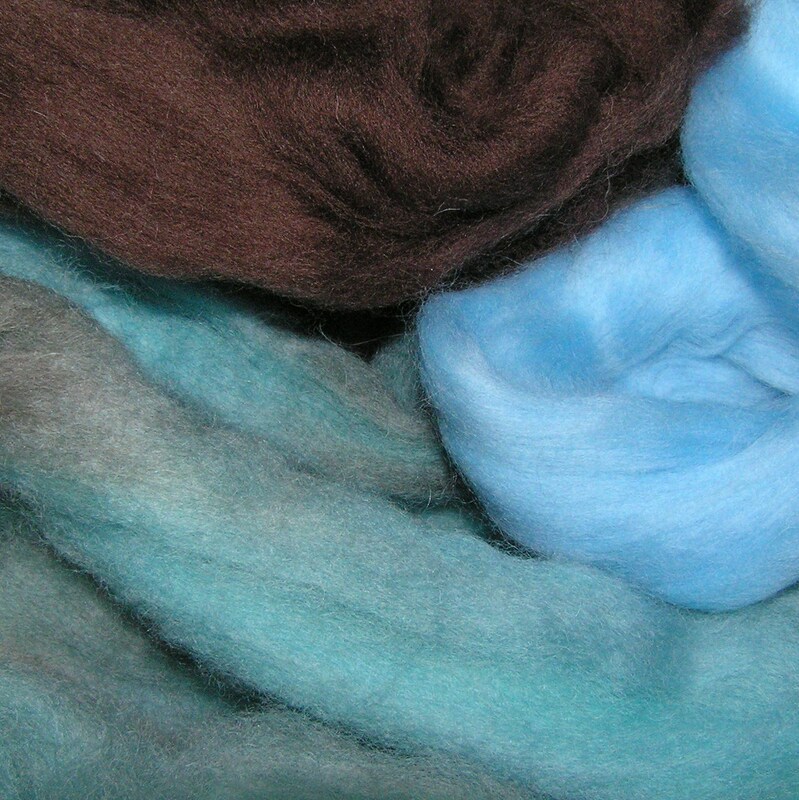 The yarn is spun from a batt made of merino, alpaca and angora so represents a good selection from the animal kingdom. 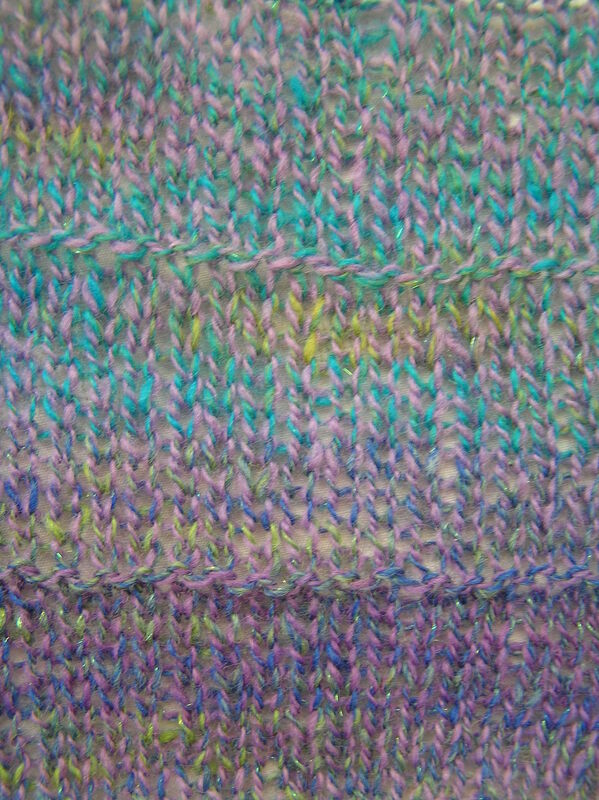 I’m not sure I carded it very well, the angora went into little clumps, but it made an interesting tweedy effect so I’m going to claim it’s a design feature. 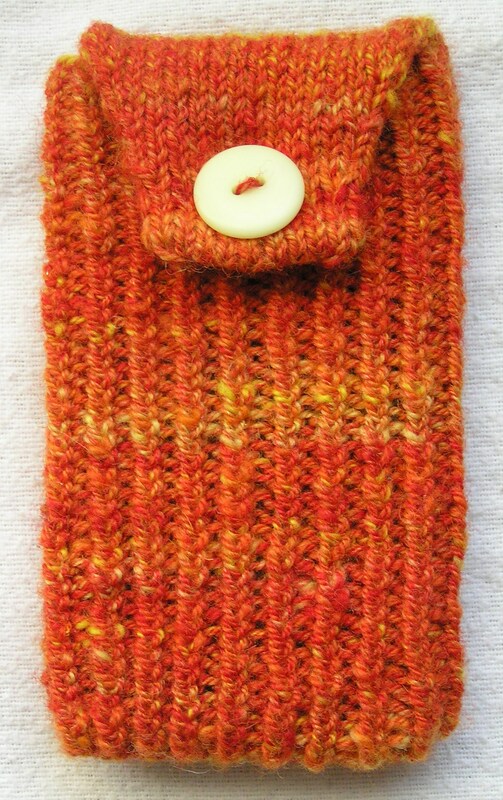 The thumb construction is deviously clever – instead of increasing to make the extra stitches you just stop decreasing within the pattern. 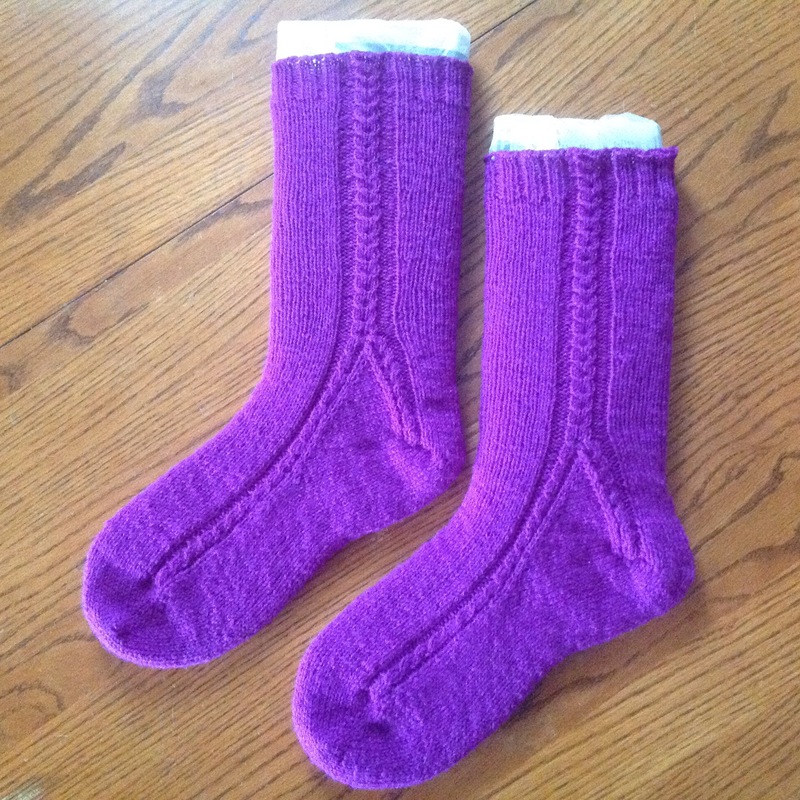 These are a gift for someone, but I think I’ll make another pair for me! How many plies does a girl need? It’s almost a year since I started spinning on a wheel. 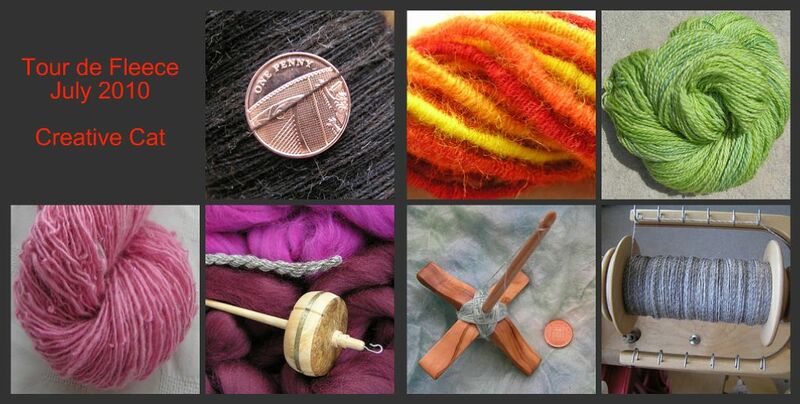 I’ve been stocking up on bobbins and whorls as the membership discount that I purchased when I bought the wheel runs out pretty soon. I’ve now got 5 standard bobbins and 4 high speed ones, which should be enough to keep me going for a long while. At around £30 per bobbin that’s a lot of money on bobbins – one of the (few) downsides of a Ladybug wheel. 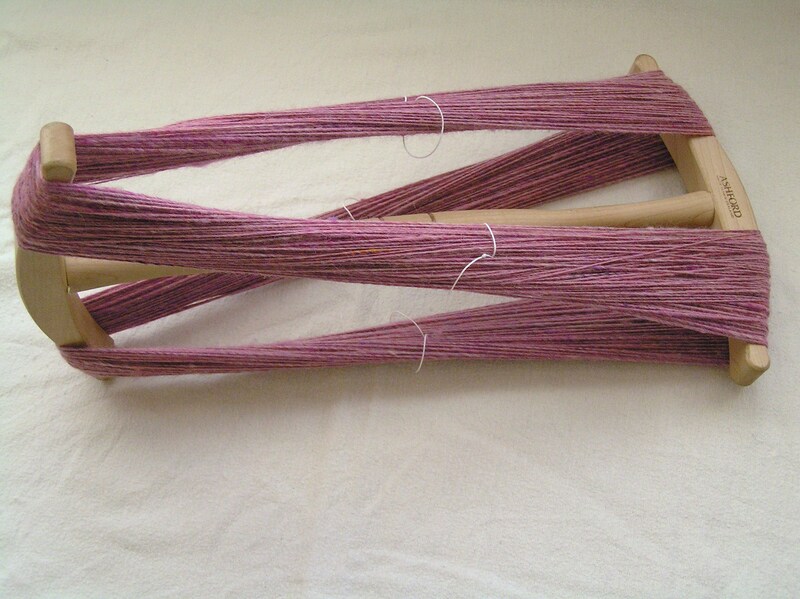 I decided to put the bobbins to good use and try a 4-ply yarn. 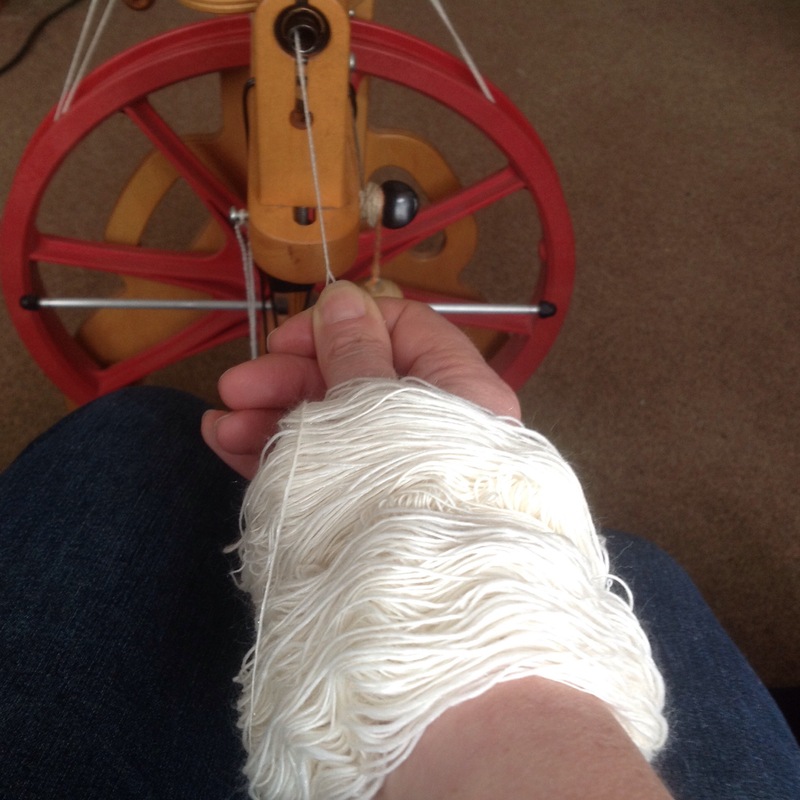 I had 100g of grey cheviot which I had already made a start on – I was impatiently trying out double drive and waiting for the high speed bobbins, so started on a standard bobbin, then put it to one side when the exciting new shiny high speed bobbins came along. Fickle, me??? So, there was about 35g on the existing bobbin so I split the remaining fibre into roughly even sections and spun three more bobbins worth. So far, so good! 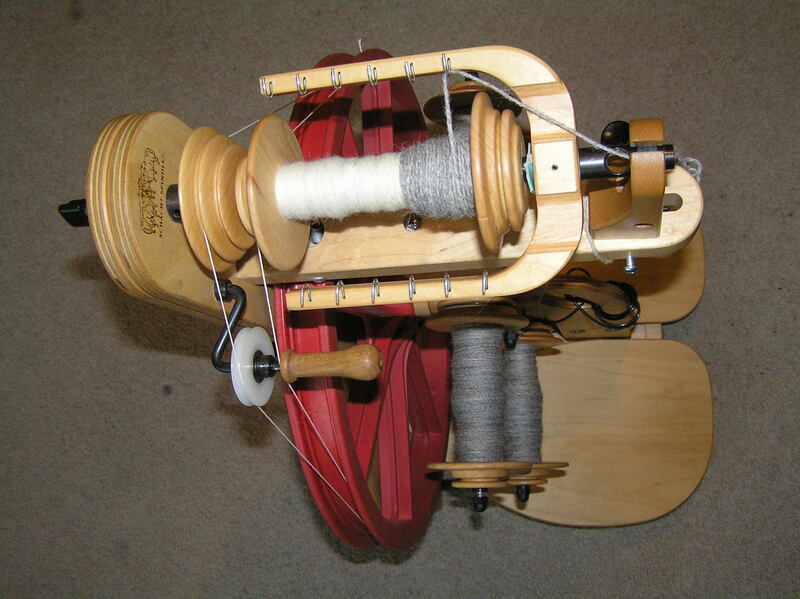 I went and fiddled with the inbuilt lazy kate, adjusting everything so all the bobbins sat nicely and the tension bands went where they should. I think I overdid it as it was hanging onto the yarn a bit too much whilst plying, so I’ll have to go and tweak it again. 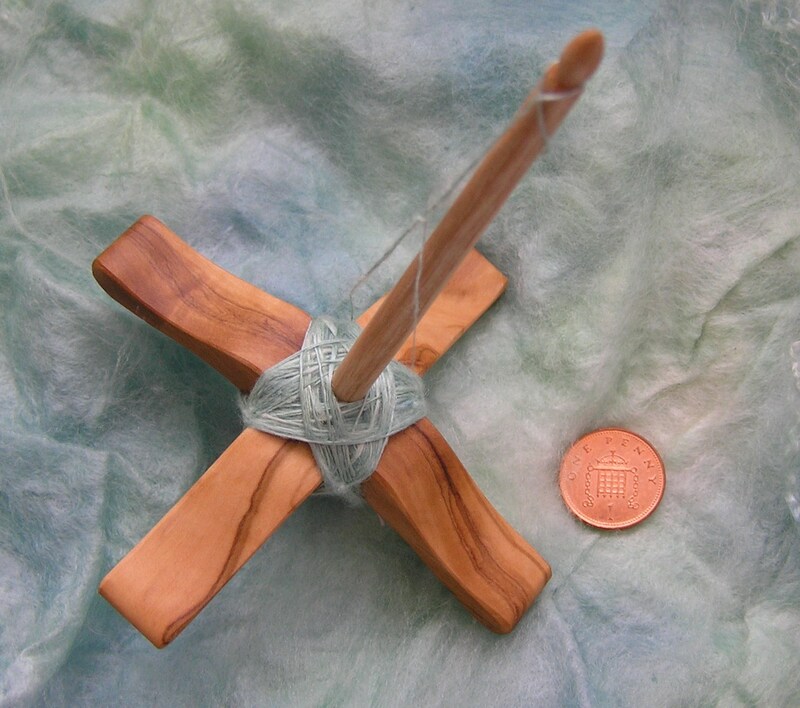 Plying four singles at once was interesting… I tend to ply using a whorl which is a couple of sizes larger than the one I used for spinning the single, but even this resulted in a somewhat overplied finished yarn. 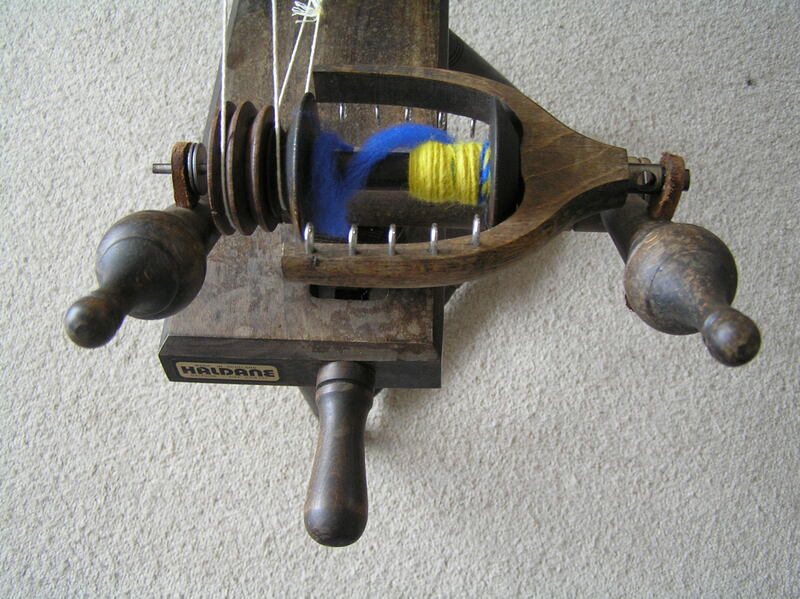 I think it was a combination of trying to keep four singles under control, them all fighting the lazy kate and me treadling like a demon. 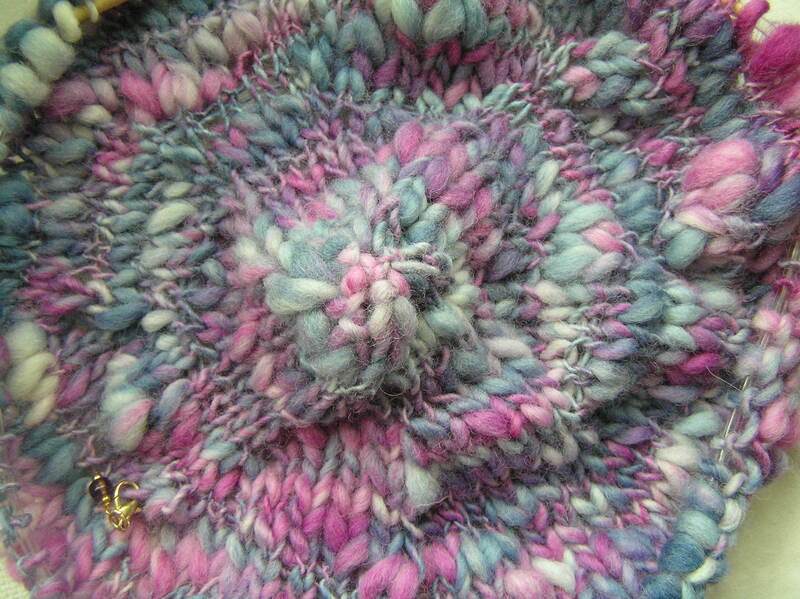 Although it wasn’t perfect it did make a lovely round yarn. Of course I ended up with three bobbins with varying amounts of singles on them, so made some more 2 ply to use it all up. I have a picture in my mind of a hat I’ve seen somewhere with a seed stitch brim, then plain stocking stitch and a knitted flower on it. Despite looking in many place I can’t find it online, so maybe someone wore it in a TV programme. 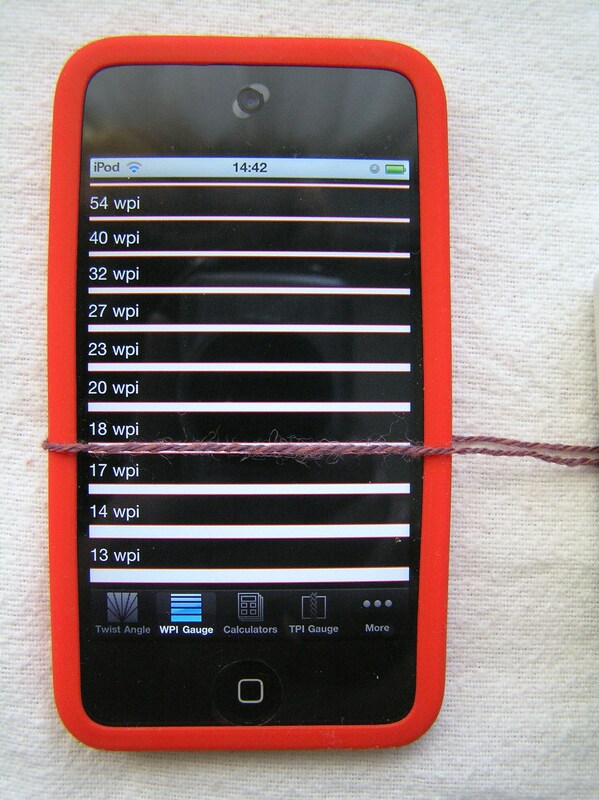 If the yarn isn’t too wire-like it may turn into something like that. 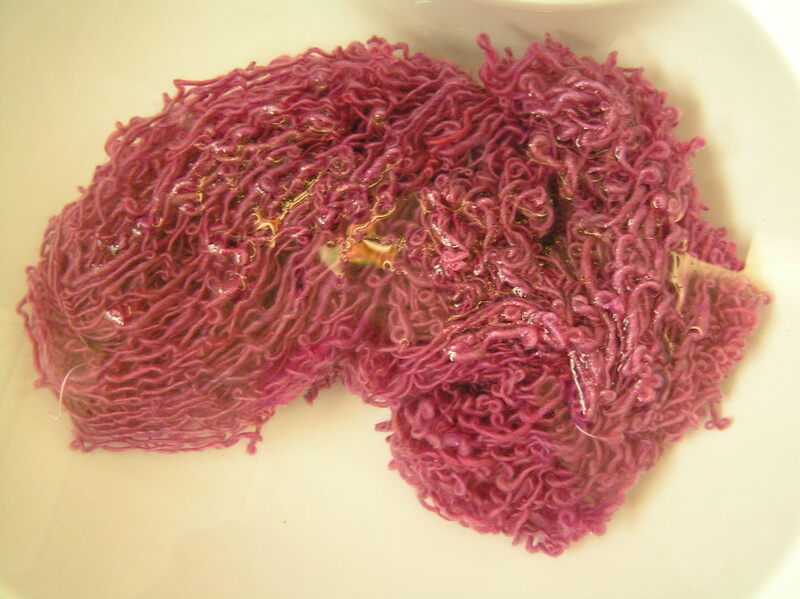 I want to try this again though – I have a vision of a lovely fat squooshy yarn which I could make into a great big wrappy round scarf. The weather is definitely changing. I am managing to stick with my running but getting up and going running at 6.00 am is getting harder as the mornings get darker and the temperature keeps dropping! 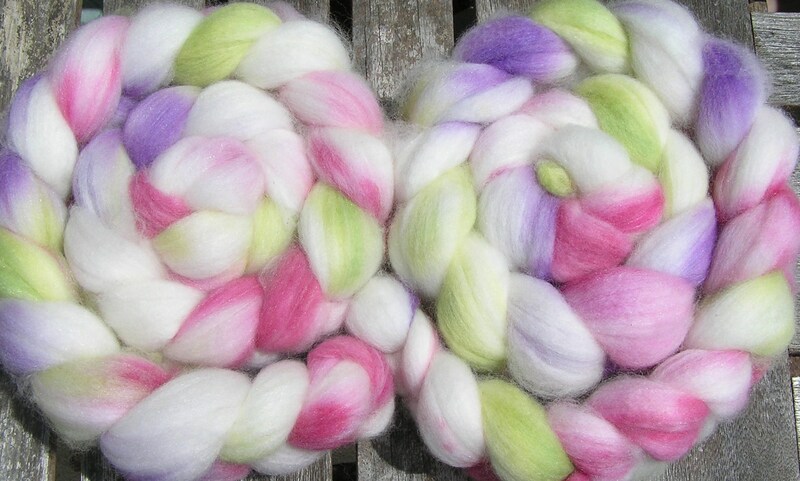 In an attempt to stop the sunshine becoming a distant memory, I spun up the Summer Flowers fibre that I dyed earlier in the year. 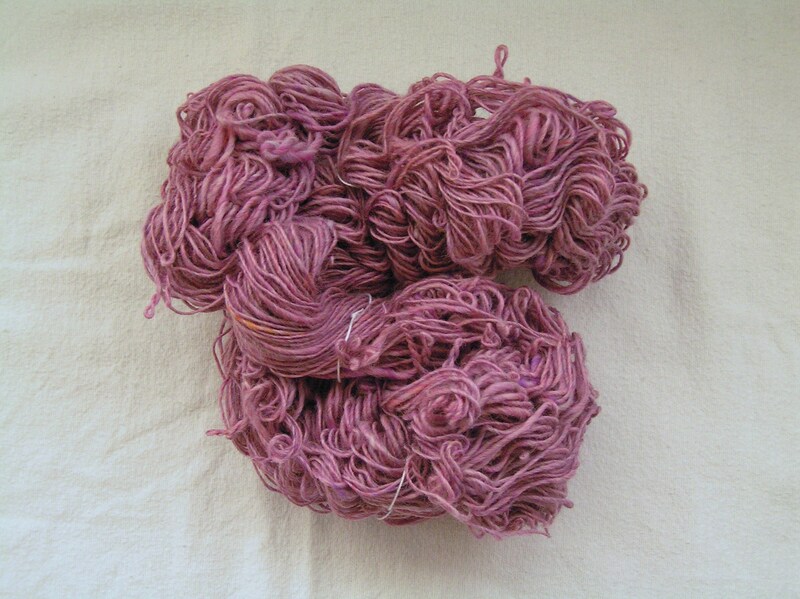 I’ve been using double drive on my Ladybug again and I’m enjoying experimenting with spinning this was and am gradually achieving thinner and thinner yarn. This yarn is just starting to become a pair of socks. Liesl – finished at last! This version is much calmer. 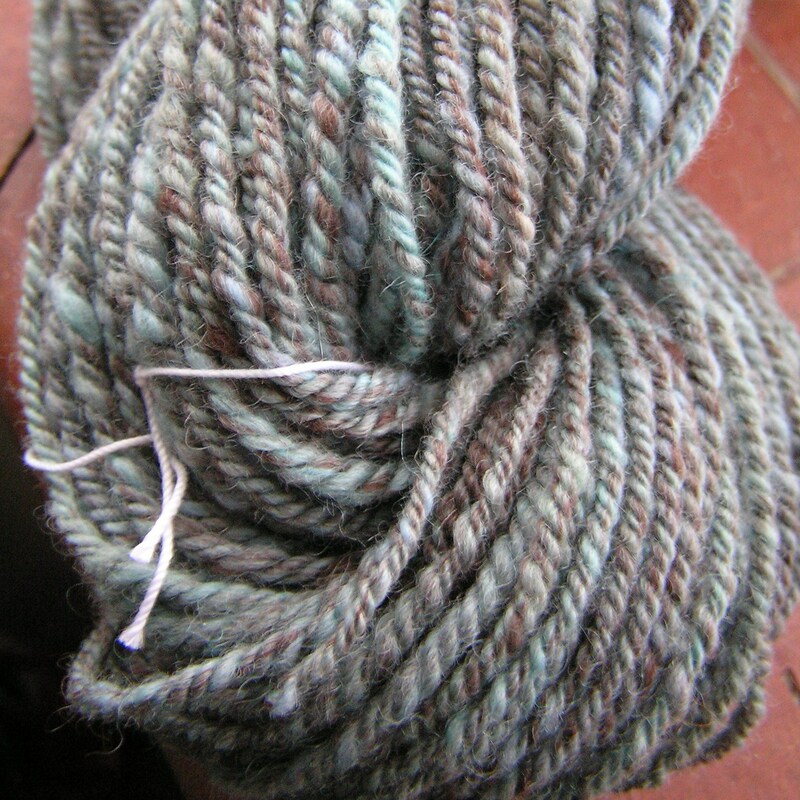 I managed to use up almost all the yarn I had spun (about 400g of arun/bulky weight) – literally just a couple of yards spare. 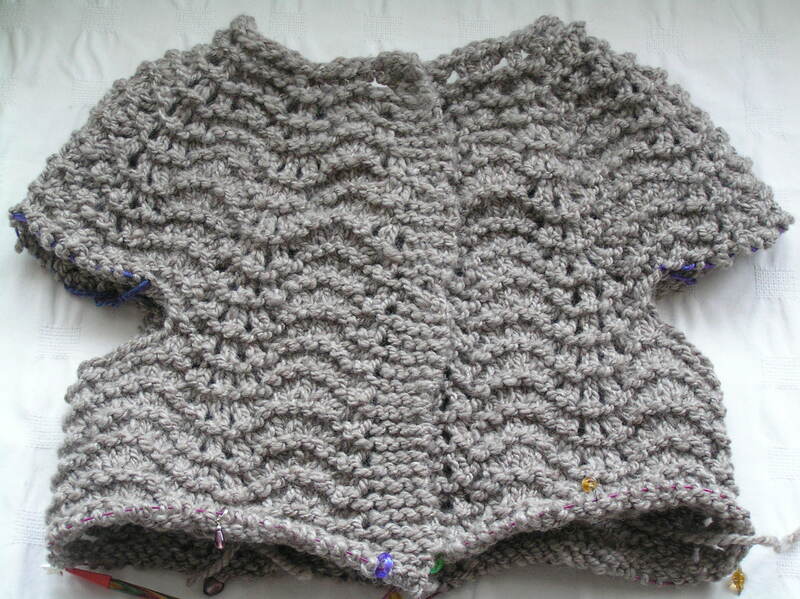 I knit the yoke and a fair bit of the body then started wondering when to stop. I went back and knitted the arms, then kept going on the body until the yarn ran out. 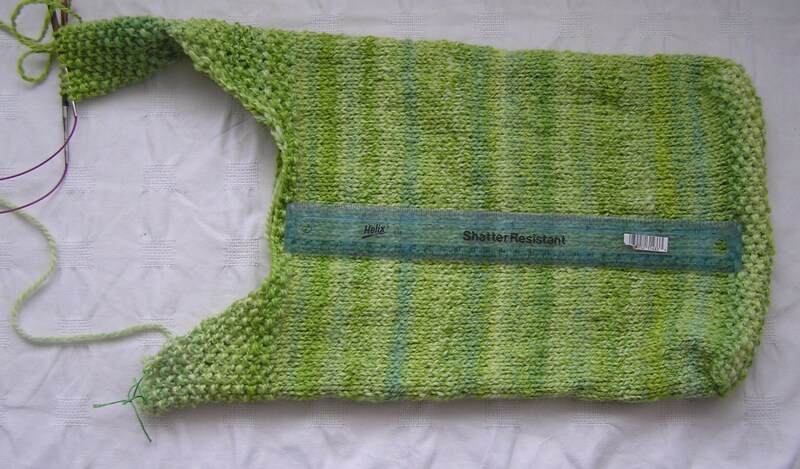 I’d like to knit another one of these – maybe a calm mix of colours, and a slightly lighter-weight yarn (this version is certainly warm and weighty)! 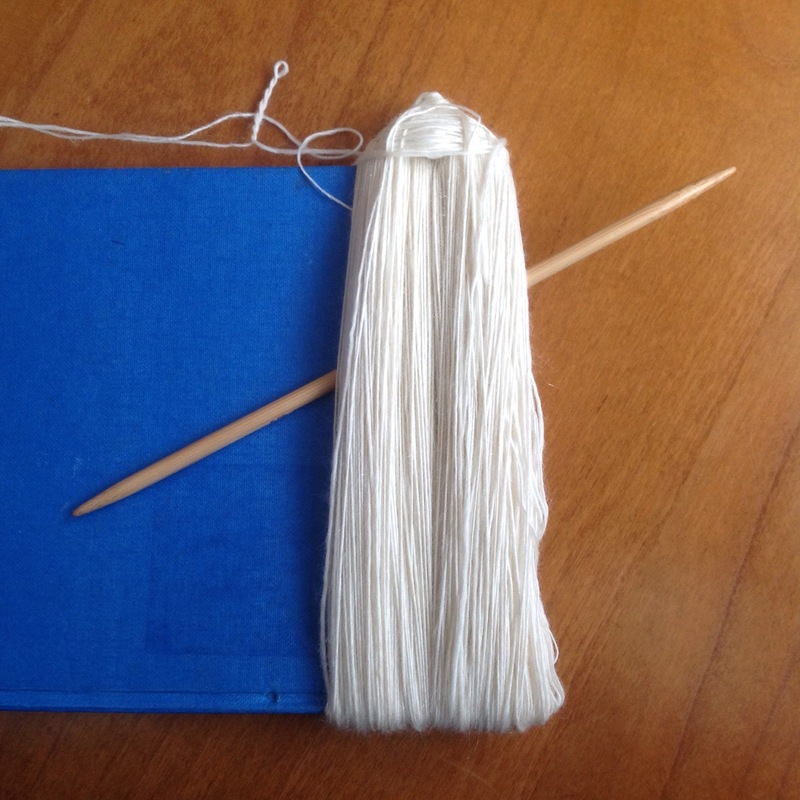 However, I did take the essentials with me – some fibre and my spindle, my copy of YarnMaker magazine, my Leyburn socks and a Liesl cardigan (if I could have got my wheel in the car I would have done)! Back to reality now, well a mountain of washing and ironing, but I do have another week off work. Amongst the many things I’d like to do this week is get one of my patterns written up and available via my blog, so watch this space! 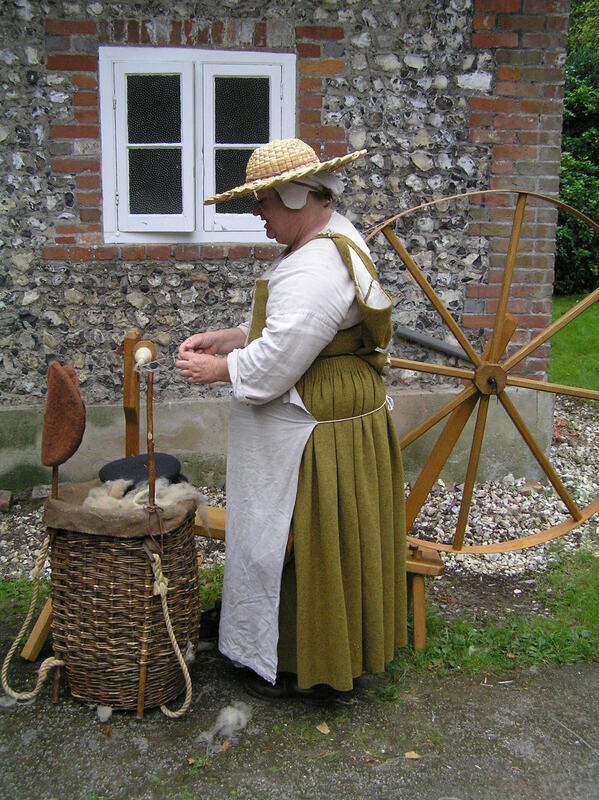 My jammy daughter has been given a Haldane wheel by a member of our spinning group! It has taken several hours of jiggling, adjusting and oiling but it is now working much more smoothly than it was. 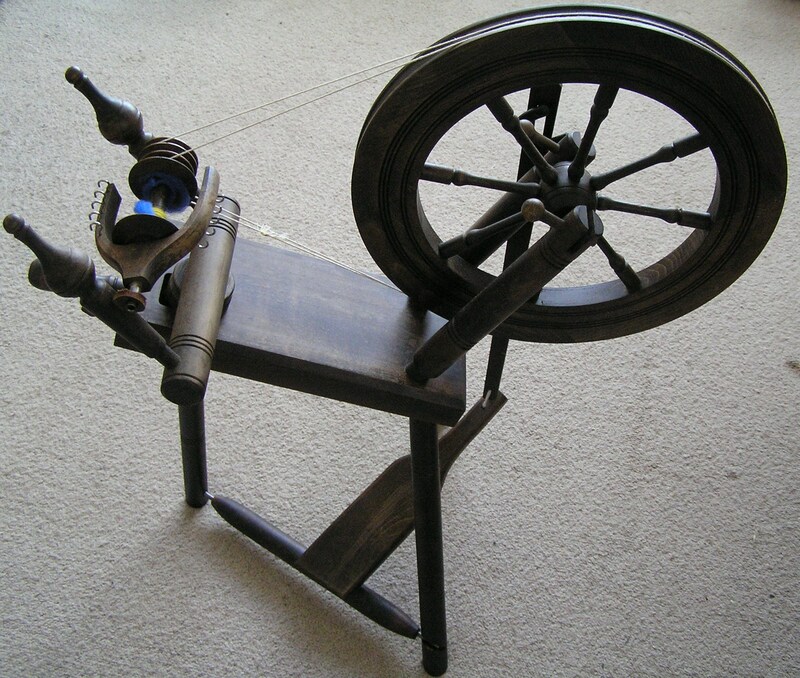 It is much harder to treadle than my Ladybug, but is growing on me. I look forward to finding out more about this wheel. 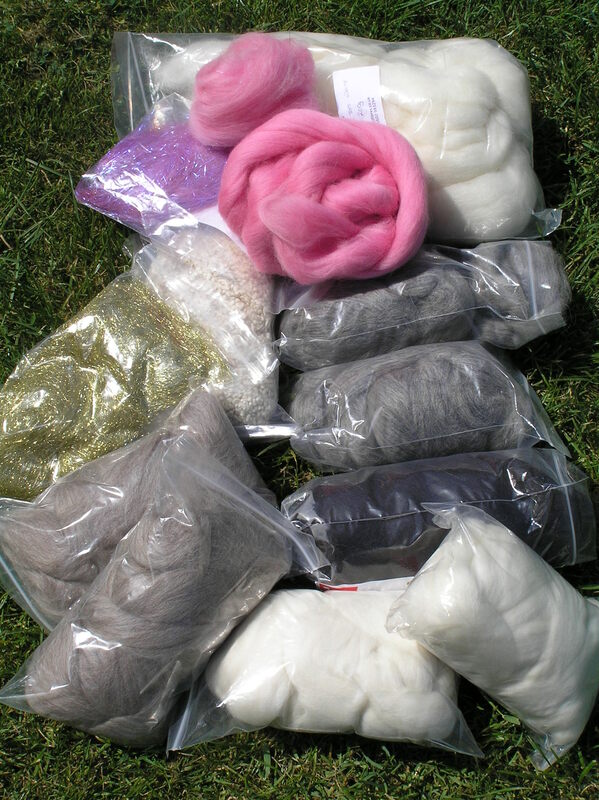 I also managed to get half an alpaca fleece for a huge £2.50 so I don’t feel left out in the goodies stakes! I had quite a productive time. I didn’t complete the projects that I had planned, I’m too easily led astray, especially with shiney new fibre and spindles. I’m pleased with what I achieved though, especially the coils! I had a lovely day yesterday. 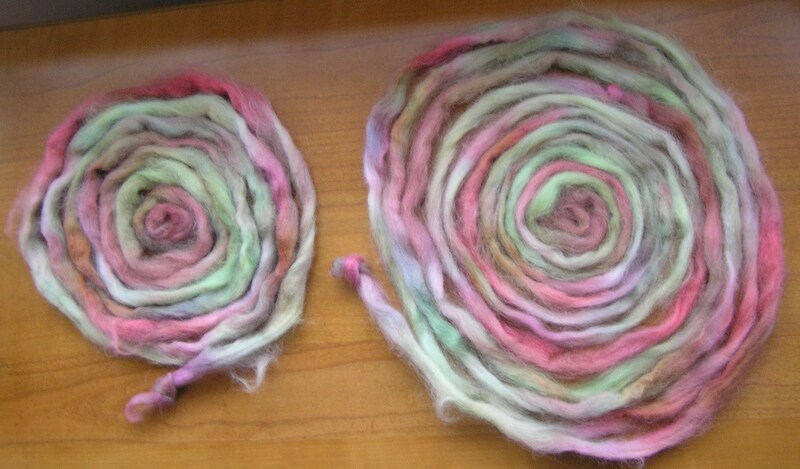 The sun shone, I enhanced my stash a bit and bought two spindles from IST Crafts. 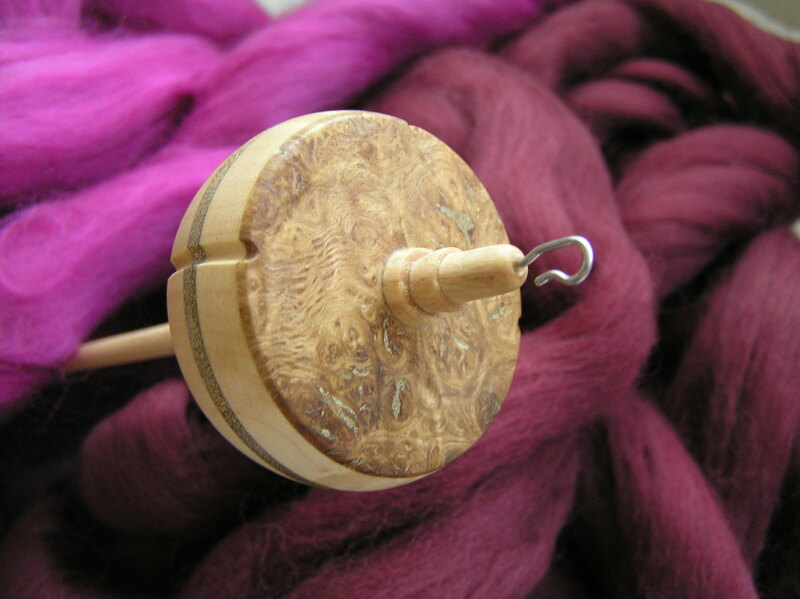 I started spinning using a spindle, an Ashford one that is about the size and weight of a small country by comparison to these! I made a few spindles myself out of wooden wheel, CDs and bits of dowel and they all worked well enough, but weren’t that well balanced. When I first got my Ladybug wheel I put the spindles to one side, but these are so pretty and spin forever. 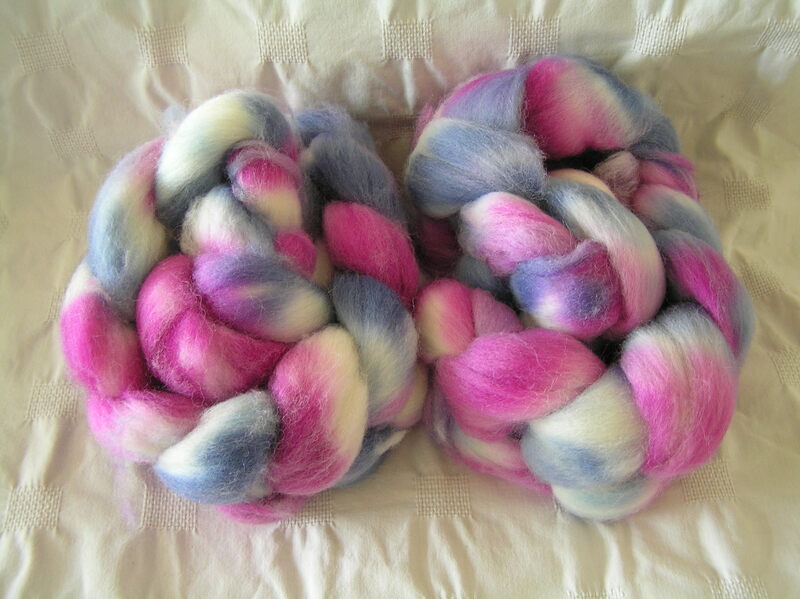 I’ve had a quick go with both of them – I bought some oatmeal BFL/silk blend which I tried out on the drop spindle after a rather nice picnic, then tried a silk hankie on the turkish spindle (after a few hours on one layer I had to admit defeat and go to bed, leaving it for another day). 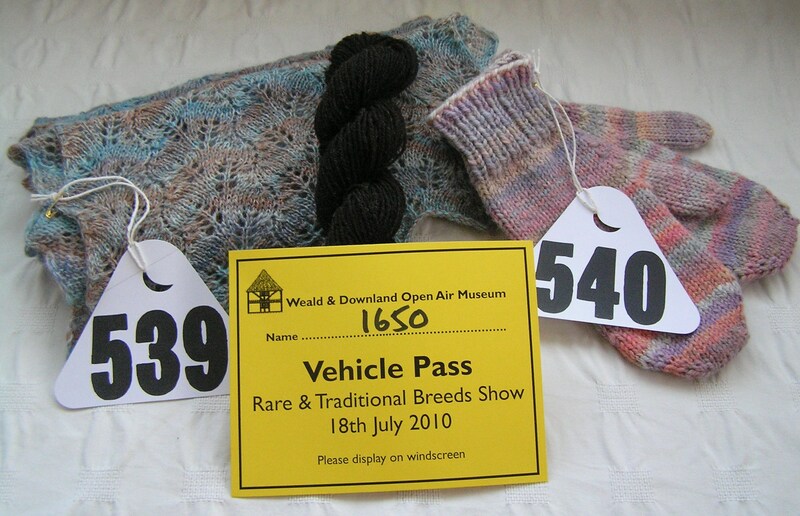 I did manage a rosette yesterday – my Shetland Fern scarf as awarded sixth place which I am delighted about! The fancy yarn class was great, and it was a skein of coiled yarn that picked up a first place so I will have to keep in training for next year! This was an odd project – it sort of came from nowhere and all worked out right. I’m sure something suitably disastrous will happen soon to rebalance this in a karma sort of way… Meanwhile I’m really happy with my new bag! 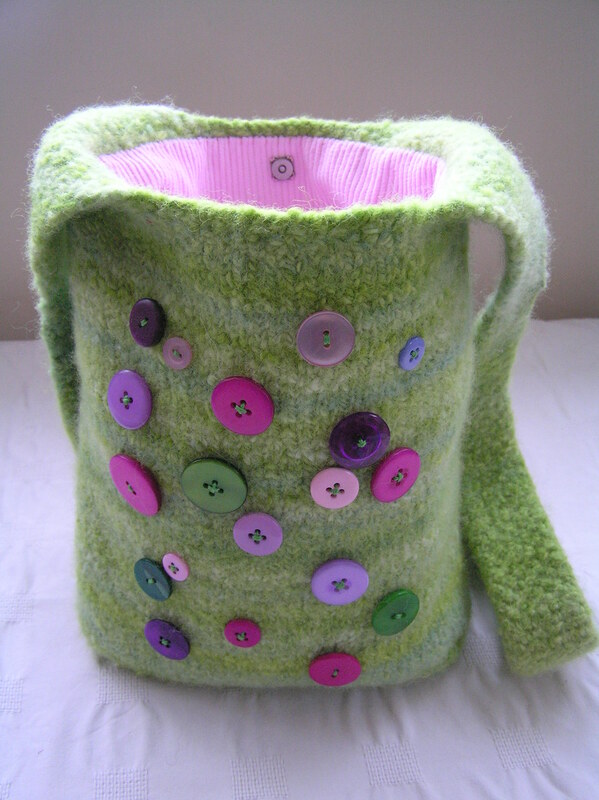 It’s lined with pink corderoy fabric and even has a magnetic fastener to keep the top shut. I’ve managed to fit my purse, camera, diary and a little bag of fibre inside it (just in case I need to try out any spindles today, you understand) and am off to test it out. 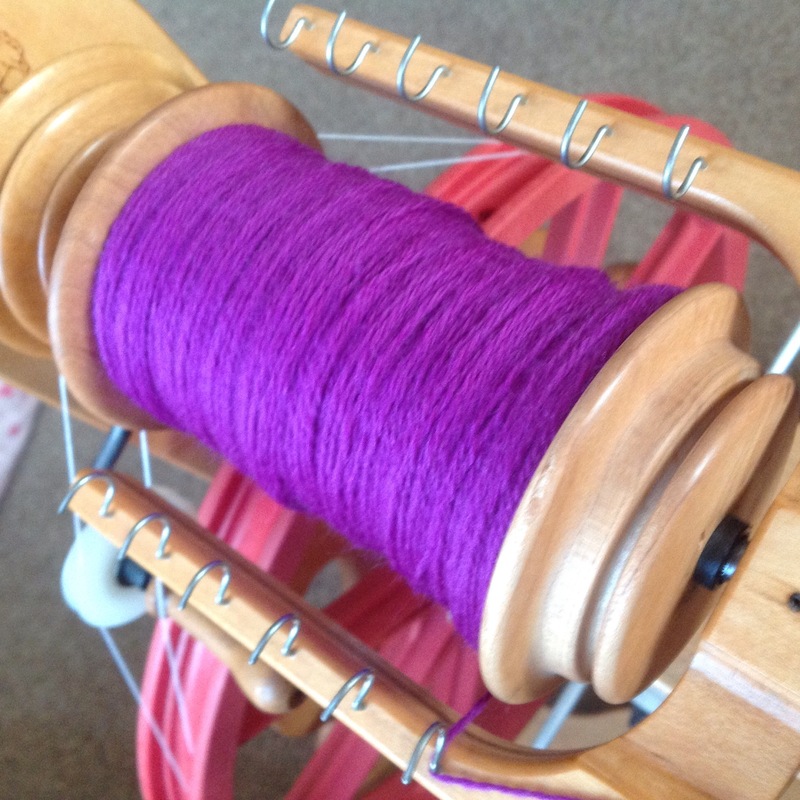 I was struggling at making coiled yarn and by happy coincidence Vampy posted a great guide on the UK Spinners’ group: http://www.ravelry.com/discuss/uk-spinners/1220078/1-25#13. 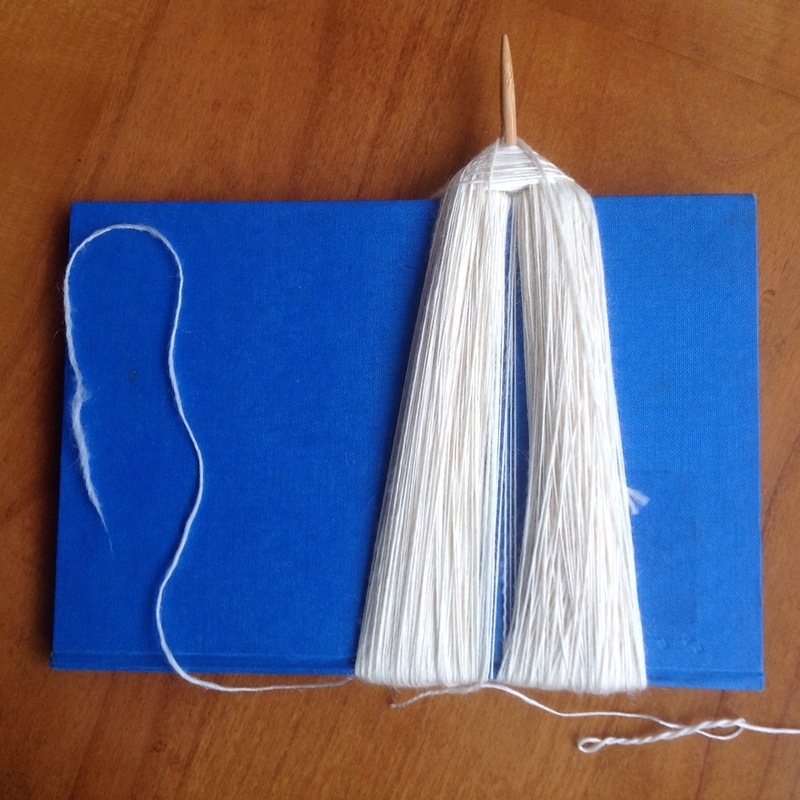 The highlighter pen is not just a random object… To make successful coils you have a core yarn which is suitably strong (I used embroidery thread) and the other single wraps around it. 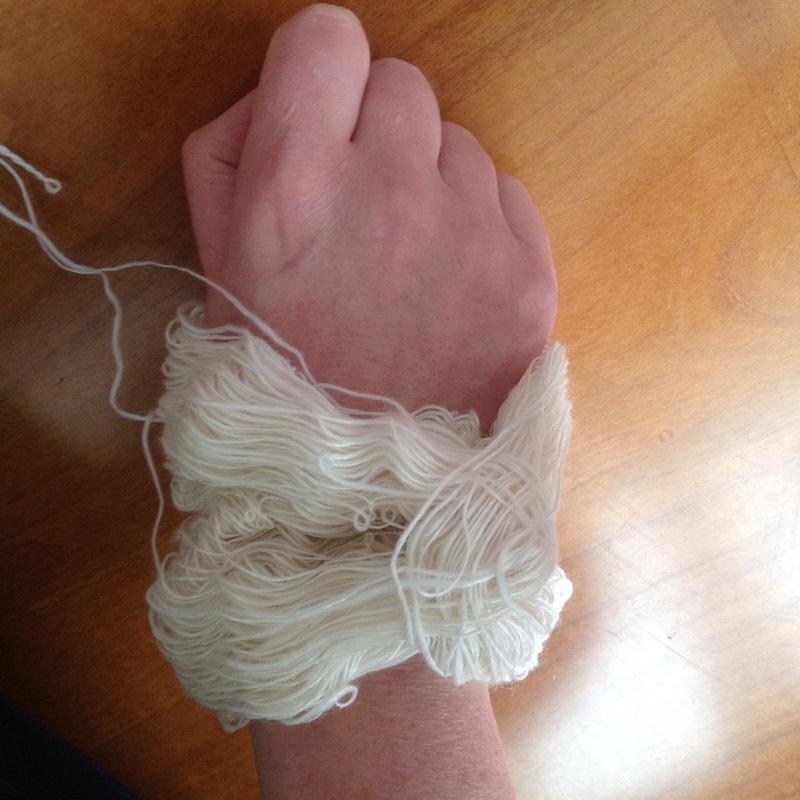 If you do a normal 2-ply, both singles wrap around each other, but here the core yarn doesn’t want to get tangled up with the other single at all. 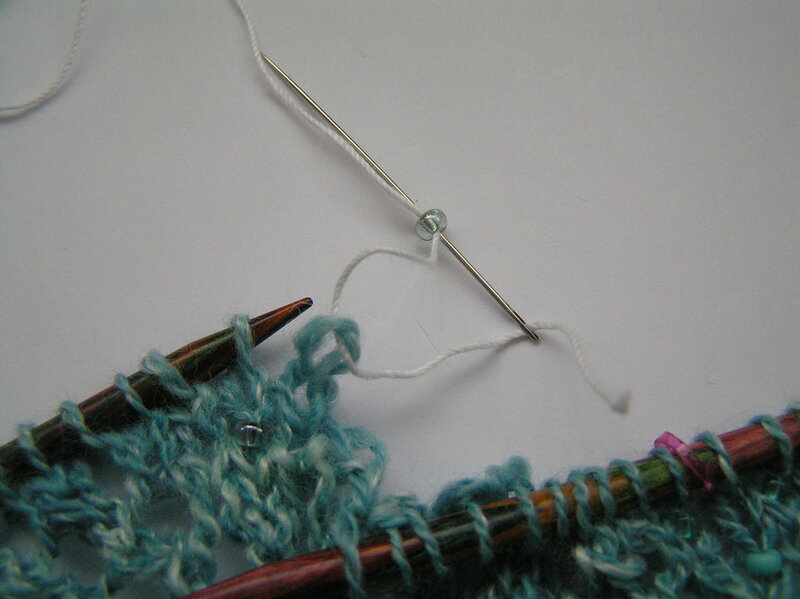 I tied both the thread and the single to the leader and then let the pen dangle down so as the thread twisted during coil spinning all the twistyness just went down the thread and made the pen spin and just sort of oozed away. When I had used up the thread that was available I just unwound a bit more and locked it under the pen clip to keep it all from unwinding too much. 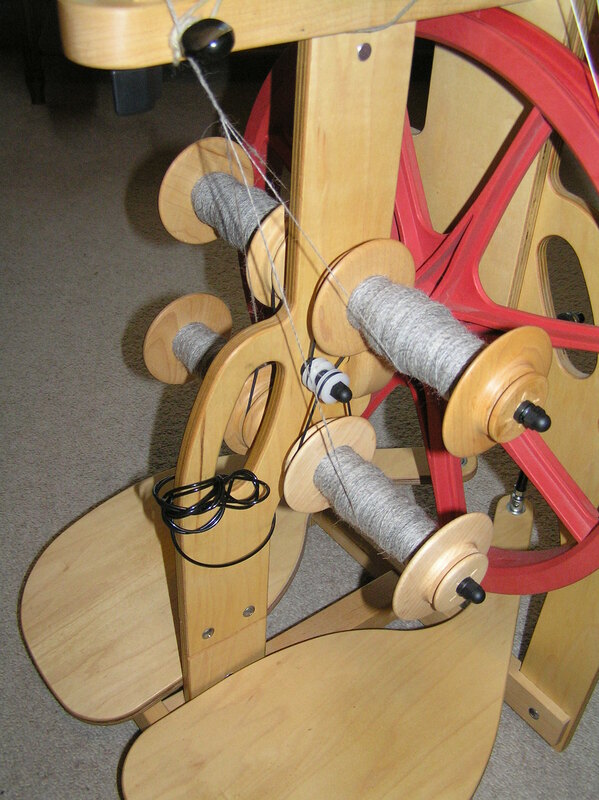 It took ages to spin the two together and after an entire evening’s work I had a grand total of… about 12 yards – wooohooo! I knitted a Booga Bag a couple of years ago and remember that it got much shorter but not a lot narrower so I’ve tried to take this into account when making this bag. 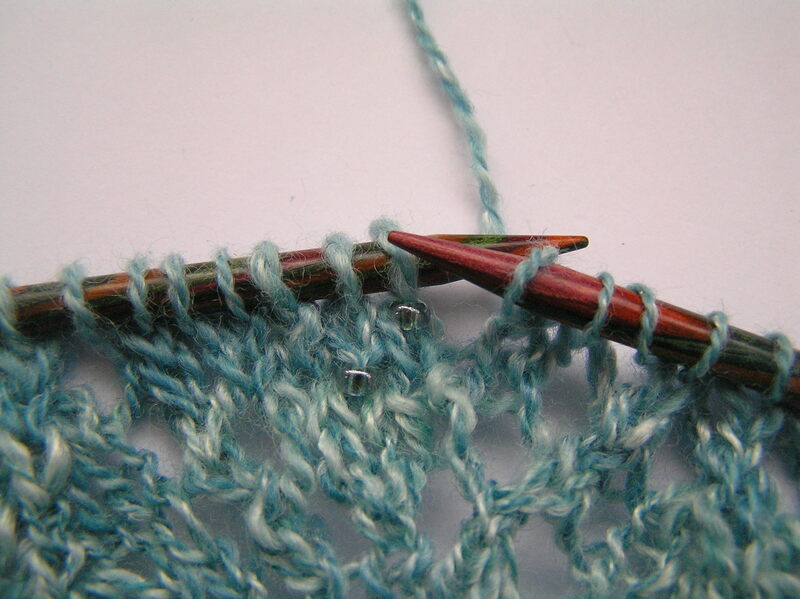 Hopefully I will finish the handle today and get it in the washing machine – I hate that bit, what if it eats all my hard work and turns it into something the size of a thimble? Then I’m on a button buying mission tomorrow so I can get it finished and use it on Sunday! 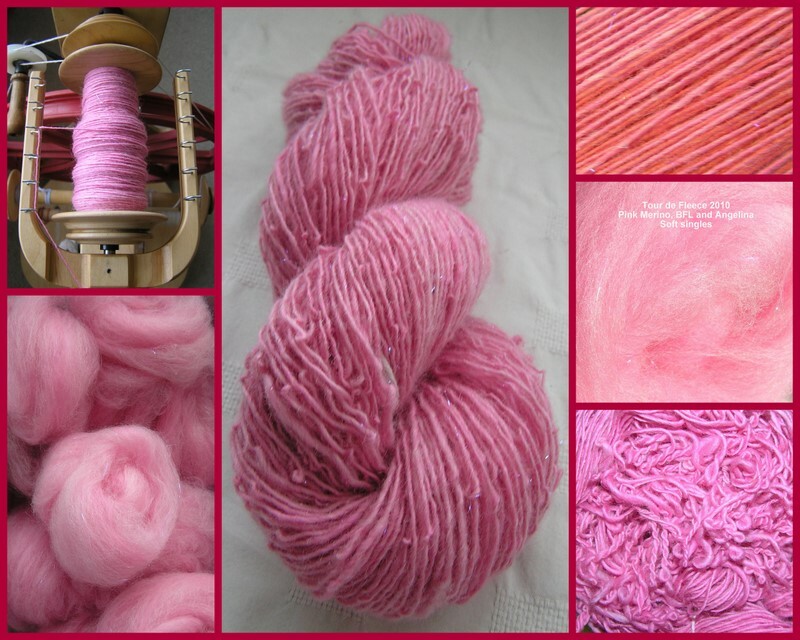 Another Tour de Fleece project – pink merino, BFL and sugarplum angelina carded together and spun as singles. I did several hot/cold/hot/cold soaks to set the twist and felt the yarn slightly so it would all hang together, which it seems to have done, even if it is still a bit curly wurly! I don’t often have a plan, things tend to just sort of happen! 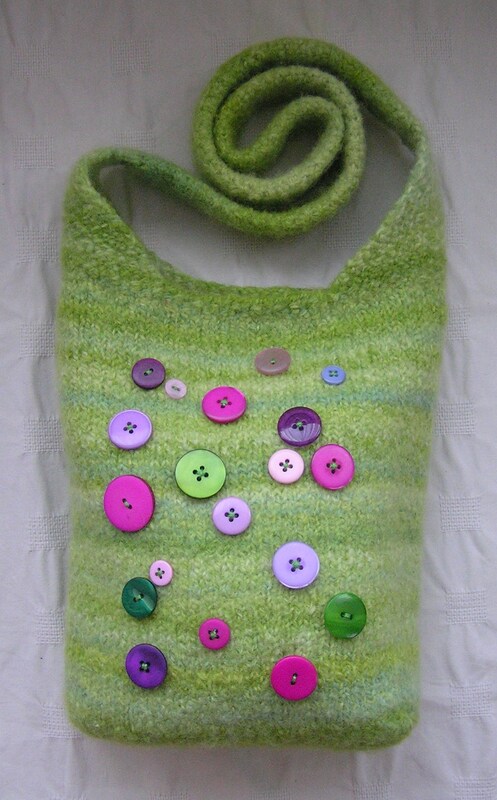 Here’s the plan – I want to make a bag, a green grassy sort of coloured bag. It’ll have a shoulder strap and I’m going to felt it. 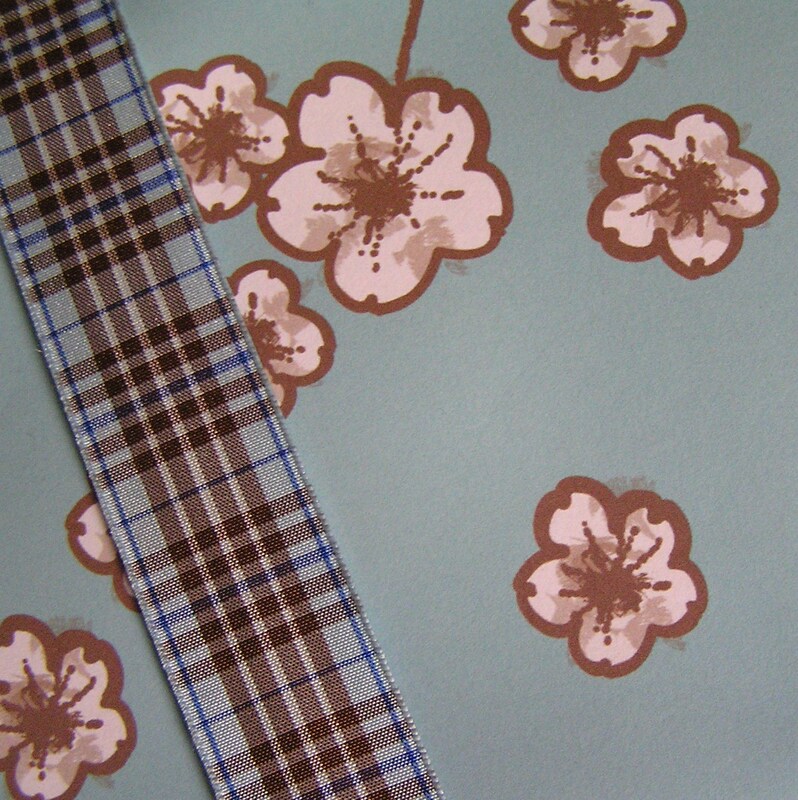 Then I’m going to find some lovely buttons in the shapes of flowers and sew them on. 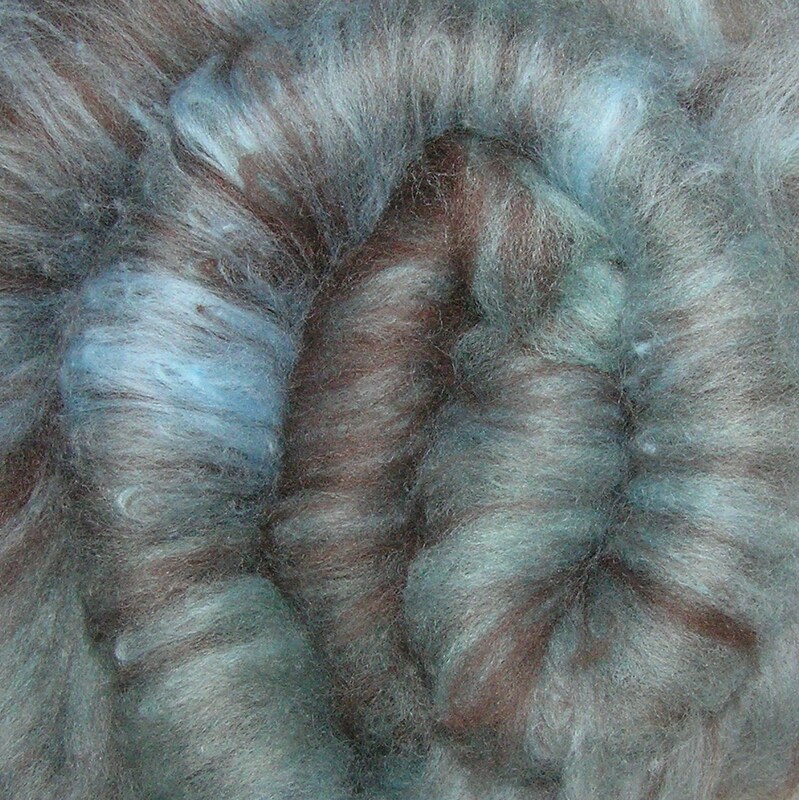 It’s 100g of Black Welsh Mountain fibre that I bought from World of Wool. 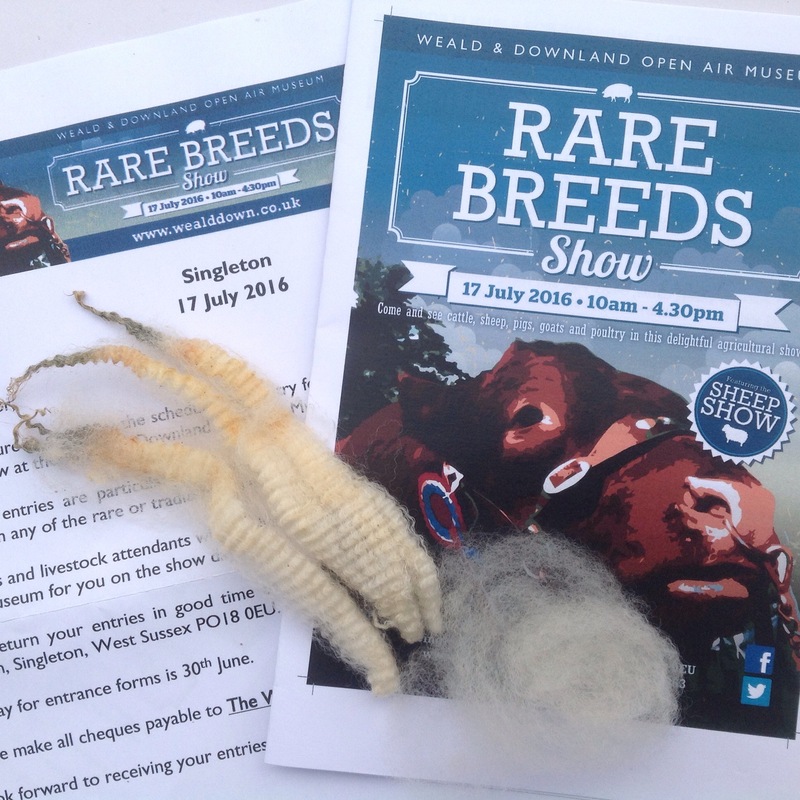 I wanted to try out this fibre as I’d been promised a fleece, but apparently the poor old sheep are still wearing it (and must be sweating away given the weather at the moment). It was my first go at using my Ladybug in Double Drive and it worked out OK, althought I found the takeup a bit light for my taste. 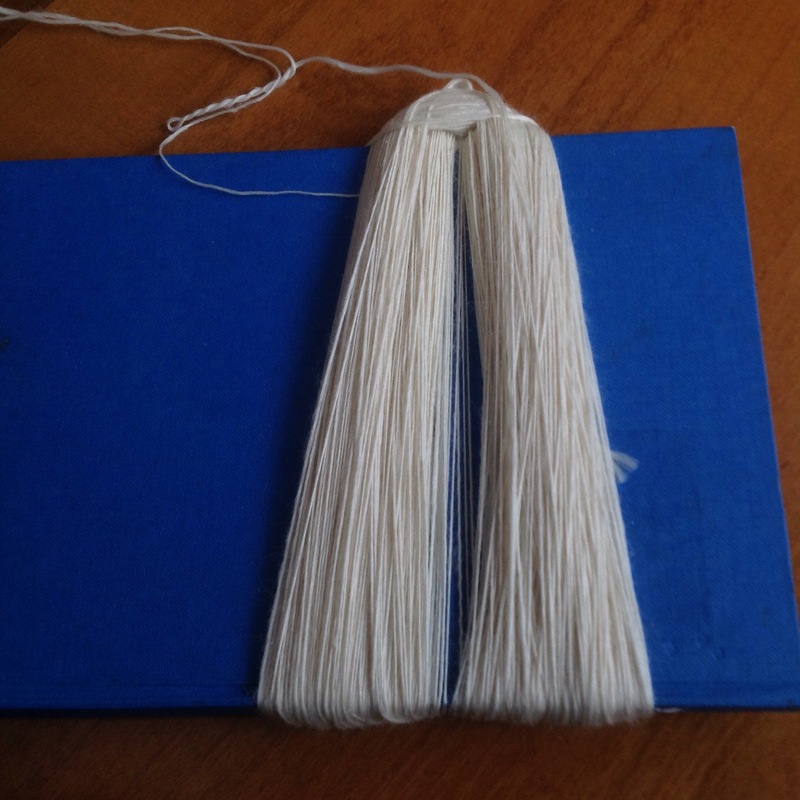 Thanks to the Schacht Spinners group on Ravelry for helping me to get all my string and whorls the right way round – I will try and write up what went where soon. 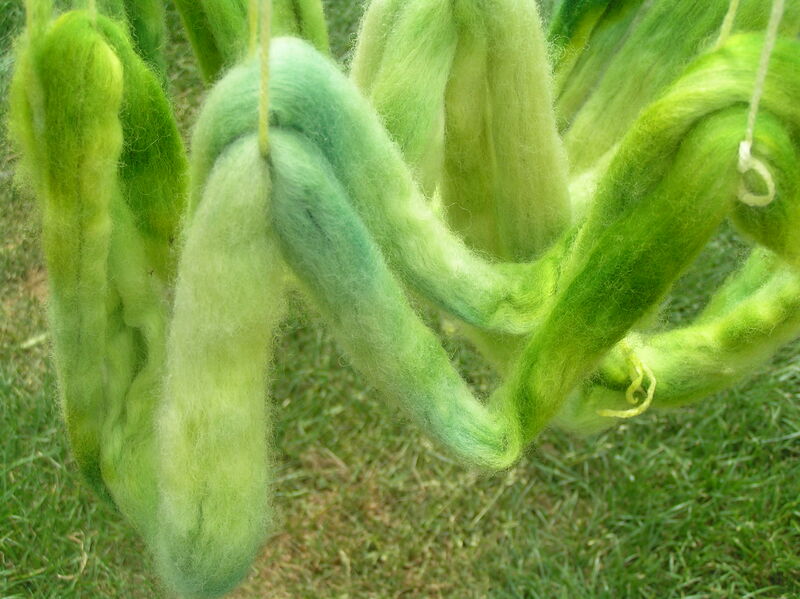 It’s nearly time for the Tour de Fleece! If you don’t know, it’s an excuse for lots of spinning, which takes place whilst the Tour de France is on. 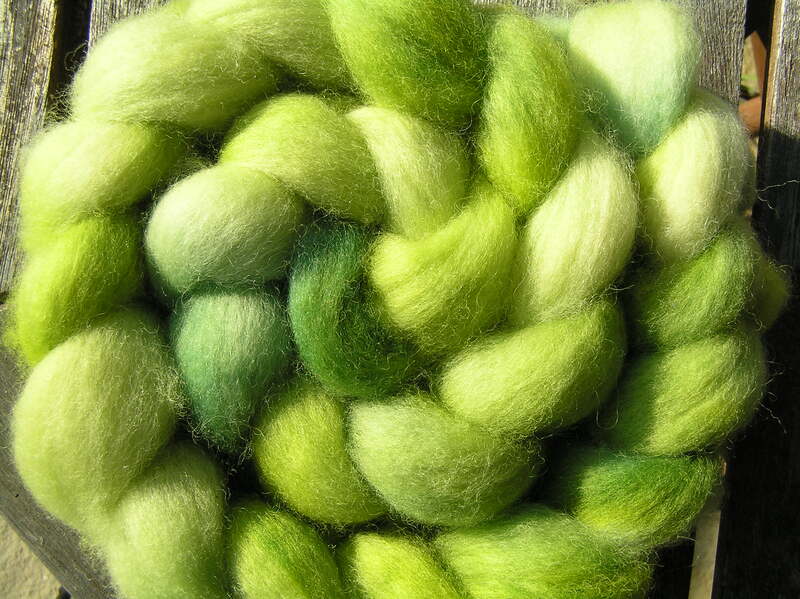 The general idea seems to be to have a good time, spin a lot and share your efforts with your fellow team members on Ravelry. I’ve signed up for two team – Team Social and Team Schacht Spinners. 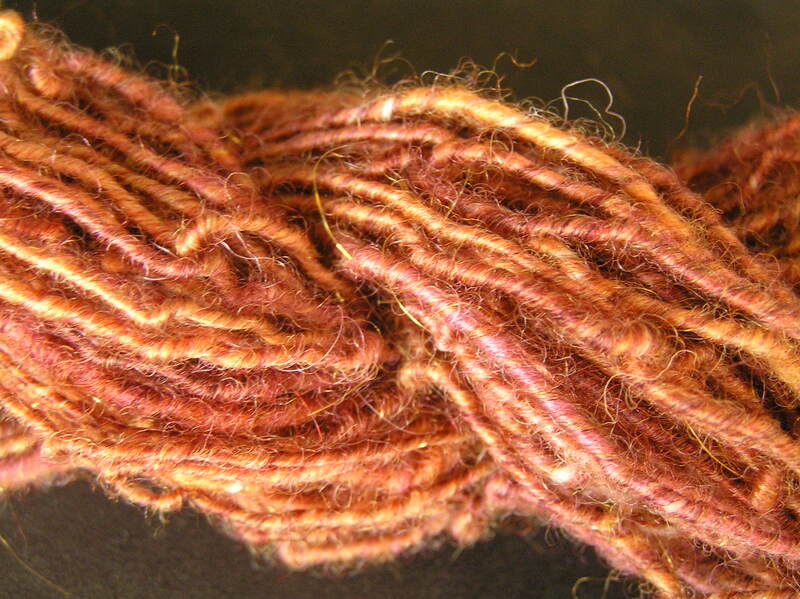 Finish spinning enough oatmeal BFL to be able to knit my Liesl. 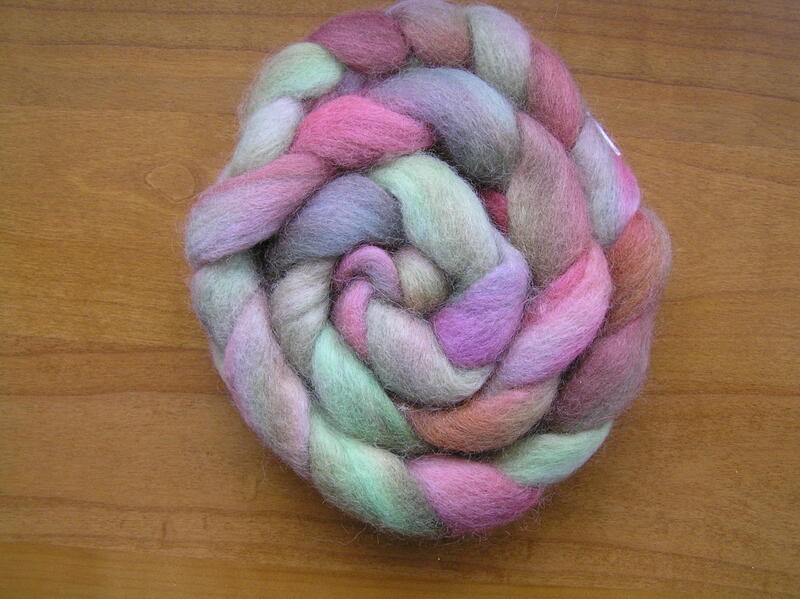 Try spinning something arty (deliberately, rather than passing off something that went wrong as experimental art yarn). Maybe using beads or coils? 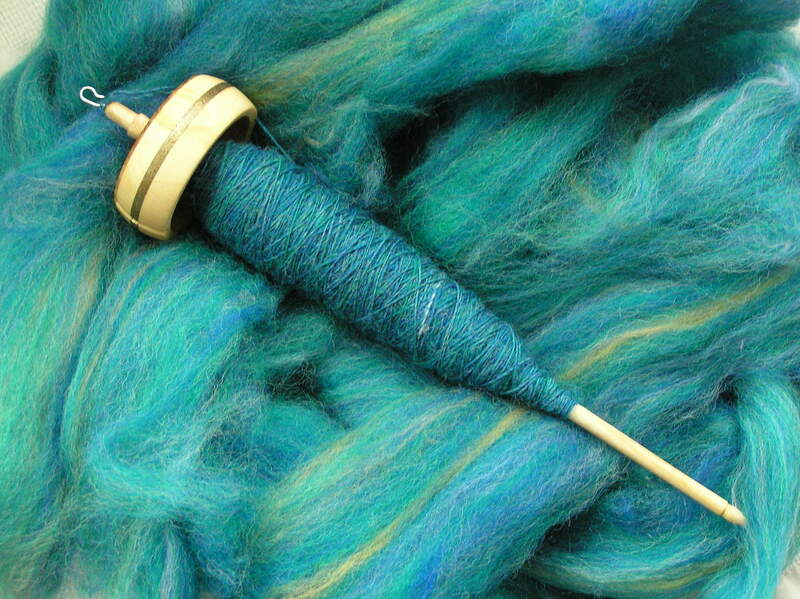 How much yarn can you get on a bobbin? 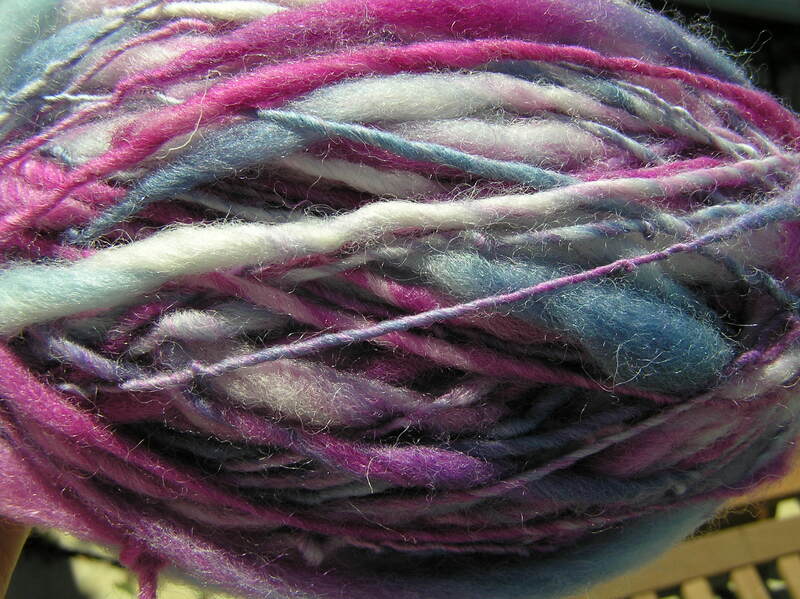 This is the purple shetland fibre that I dyed in my second attempt at dyeing, plied with the various blue/purple/teal/green/angelina fibres that I carded together. This measured up to be around 700 yards of somewhere between lace and fingeringweight yarn. The purple has dulled down the brighter colours somewhat. 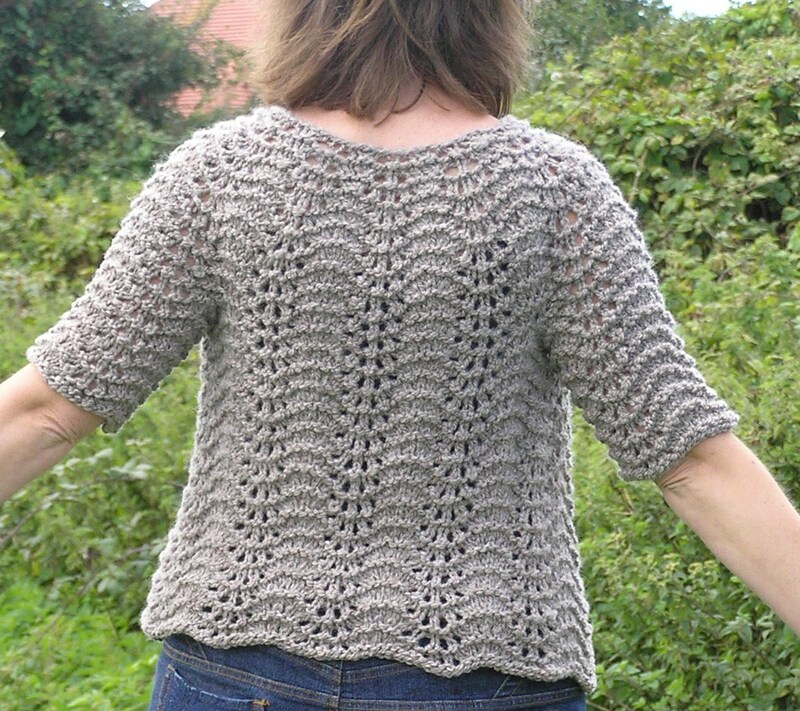 I had ideas of making a lightweight cardigan, knitting a thin yarn on big needles and weighing the cuffs and edges down by adding beads. 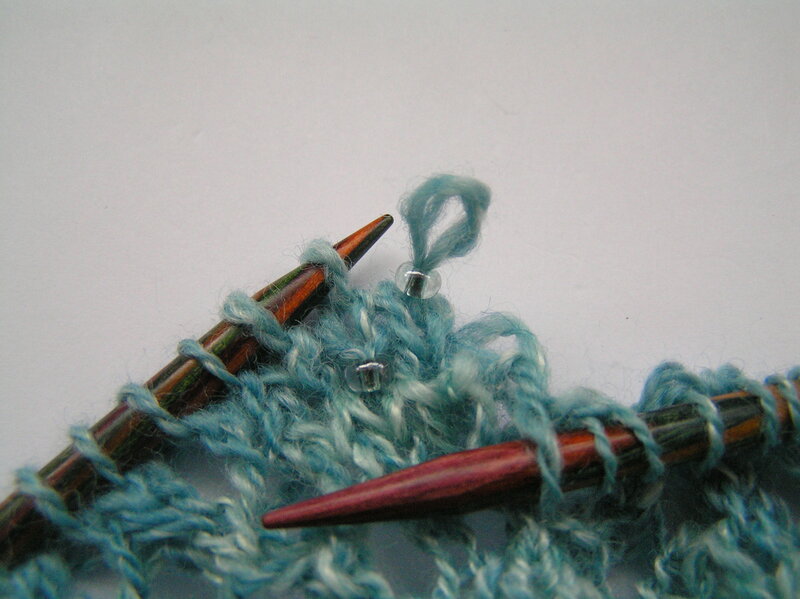 I’m not so sure now, this might become a wide stole, maybe based on a feather and fan stitch. 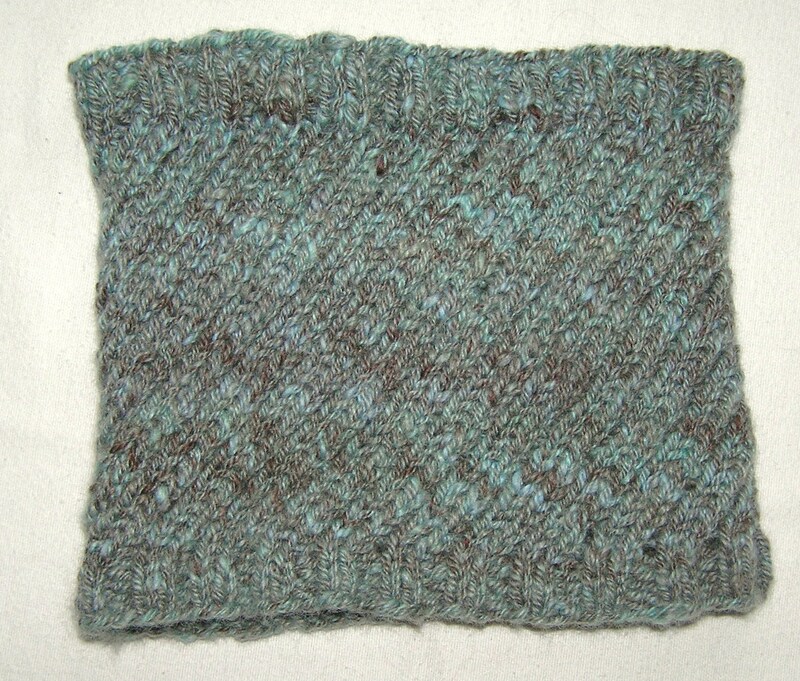 I tried a swatch, just to see how it knit up.